☒Annual report pursuant to Section 13 or 15(d) of the Securities Exchange Act of 1934. ☐Transition report pursuant to Section 13 or 15(d) of the Securities Exchange Act of 1934. The aggregate market value of the 20,094 membership units held by non-affiliates of the registrant (computed by reference to the most recent offering price of membership units) was $20,094,000 as of April 30, 2018. The membership units are not listed on an exchange or otherwise publicly traded. Additionally, the membership units are subject to significant restrictions on transfer under the registrant’s operating and member control agreement. The value of the membership units for this purpose has been based solely upon the initial offering price of the membership units. In determining this value, the registrant has assumed that all of its governors, chief executive officer, chief financial officer and beneficial owners of 5% or more of its outstanding membership units are affiliates, but this assumption shall not apply to or be conclusive for any other purpose. As of January 29, 2019, there were 30,606 membership units outstanding. The registrant has incorporated by reference into Part III of this Annual Report on Form 10-K portions of its definitive proxy statement to be filed with the Securities and Exchange Commission within 120 days after the close of the fiscal year covered by this Annual Report (October 31, 2018). This proxy statement is referred to in this report as the 2019 Proxy Statement. Our units are subject to a number of transfer restrictions, no public market exists for our units, and we do not expect one to develop. Our actual results or actions may differ materially from these forward-looking statements for many reasons, including the reasons described in Part I, Item 1A. “Risk Factors” of this Form 10-K. We undertake no duty to update these forward-looking statements, even though our situation may change in the future. We cannot guarantee future results, levels of activity, performance or achievements. We caution you not to put undue reliance on any forward-looking statements, which speak only as of the date of this report. You should read this report and the documents that we reference in this report and have filed as exhibits, completely and with the understanding that our actual future results may be materially different from what we currently expect. We qualify all of our forward-looking statements with these cautionary statements. Unless otherwise stated, references in this report to particular years or quarters refer to our fiscal years ended October 31 and the associated quarters of those fiscal years. Much of the information in this report regarding the ethanol industry, including government regulation relevant to the industry, the market for our products and competition is from information published by the Renewable Fuels Association (“RFA”), a national trade association for the U.S. ethanol industry, as well as other publicly available information from governmental agencies or publications. Although we believe these sources are reliable, we have not independently verified the information. Our principal executive offices are located at 15045 Highway 23 SE, Granite Falls, Minnesota 56241, and our telephone number is 320-564-3100. We make available free of charge on or through our Internet website, www.granitefallsenergy.com, all of our reports and all amendments to those reports as soon as reasonably practicable after such material is electronically filed with, or furnished to, the Securities and Exchange Commission (SEC). The Securities and Exchange Commission also maintains an Internet site (http://www.sec.gov) through which the public can access our reports. We will provide electronic or paper copies of these documents free of charge upon request. When we use the terms “Granite Falls Energy” or “GFE” or similar words in this Annual Report on Form 10-K, unless the context otherwise requires, we are referring to Granite Falls Energy, LLC and our operations at our ethanol production facility located in Granite Falls, Minnesota. When we use the terms “Heron Lake BioEnergy”, “Heron Lake”, or “HLBE” or similar words, unless the context otherwise requires, we are referring to Heron Lake BioEnergy, LLC and its wholly owned subsidiary, HLBE Pipeline Company, LLC, through which HLBE holds a 73.0% controlling interest in Agrinatural Gas, LLC. When we use the terms the “Company”, “we”, “us”, “our” or similar words in this Annual Report on Form 10-K, unless the context otherwise requires, we are referring to Granite Falls Energy, LLC and our consolidated wholly- and majority owned subsidiaries. Granite Falls Energy, LLC is a Minnesota limited liability company formed on December 29, 2000 for the purpose of constructing, owning and operating a fuel-grade ethanol plant located in Granite Falls, Minnesota. In July 2013, we acquired controlling interest in Heron Lake BioEnergy, LLC (“Heron Lake BioEnergy” or “HLBE”), which owns an ethanol plant located near Heron Lake, Minnesota. As of October 31, 2018, we control approximately 50.7% of HLBE’s outstanding membership units through our wholly owned subsidiary, Project Viking, L.L.C. As a result of our majority ownership, we have the right to appoint five (5) of the nine (9) governors to HLBE’s board of governors under its member control agreement. Our business consists primarily of the production and sale of ethanol and its co-products (wet, modified wet and dried distillers’ grains, corn oil and corn syrup) locally, and throughout the continental U.S. However, as markets allow, our products can be, and have been, sold in the export markets. Our revenues from operations come from three primary sources: sales of fuel ethanol, sales of distillers’ grains and sales of corn oil at GFE’s ethanol plant and HLBE’s ethanol plant. Our business consists primarily of producing ethanol and its related co-products, including wet, modified and dried distillers’ grains, as well as corn oil. Our ethanol production operations are carried out at our ethanol plant located in Granite Falls, Minnesota and at the ethanol plant operated by HLBE located near Heron Lake, Minnesota. The GFE plant has an annual nameplate production capacity of approximately 63 million gallons of denatured ethanol, but is currently permitted to produce up to 70 million gallons of undenatured ethanol on a twelve-month rolling sum basis. The HLBE plant has an approximate annual nameplate production capacity of approximately 65 million gallons of denatured ethanol, but is currently permitted to produce up to approximately 72.3 million gallons of undenatured fuel-grade ethanol on a twelve-month rolling sum basis. We intend to continue working toward increasing production at both the GFE and HLBE plants to take advantage of the additional production allowed pursuant to our permits as long as we believe it is profitable to do so. HLBE also owns a controlling 73.0% interest in Agrinatural Gas, LLC (“Agrinatural”), through its wholly owned subsidiary, HLBE Pipeline Company, LLC. The remaining 27.0% non-controlling interest is owned by Rural Energy Solutions, LLC (“RES”). Agrinatural is a natural gas pipeline company that was formed to construct, own, and operate the natural gas pipeline that provides natural gas to HLBE’s ethanol production facility and other customers through a connection with the natural gas pipeline facilities of Northern Border Pipeline Company in Cottonwood County, Minnesota. Agrinatural owns approximately 190 miles of natural gas pipeline and provides natural gas to HLBE’s ethanol plant and other commercial, agricultural and residential customers through a connection with the natural gas pipeline facilities of Northern Border Pipeline Company. Agrinatural’s revenues are generated through natural gas distribution fees and sales. HLBE is its largest customer by volume and revenue. Accounting Standards Codification (“ASC”) 280, “Segment Reporting,” establishes the standards for reporting information about segments in financial statements. Operating segments are defined as components of an enterprise for which separate financial information is available that is evaluated regularly by the chief operating decision maker in deciding how to allocate resources and in assessing performance. Therefore, in applying the criteria set forth in ASC 280, the Company determined that based on the nature of the products and production process and the expected financial results, the Company’s operations at GFE’s ethanol plant and HLBE’s plant, including the production and sale of ethanol and its co-products, are aggregated into one reporting segment. Additionally, we also realize relatively immaterial revenue from natural gas pipeline operations at Agrinatural, HLBE’s majority owned subsidiary. Before and after accounting for intercompany eliminations, these revenues from Agrinatural represent less than 1% of our consolidated gross revenues and have little to no impact on the overall performance of the Company. Therefore, our management does not separately review Agrinatural’s revenues, cost of sales or other operating performance information. Rather, management reviews Agrinatural’s natural gas pipeline financial data on a consolidated basis with our ethanol production operating segment. Additionally, management believes that the presentation of separate operating performance information for Agrinatural’s natural gas pipeline operations would not provide meaningful information to a reader of the Company’s financial statements and would not achieve the basic principles and objectives of ASC 280. We currently do not have or anticipate we will have any other lines of business or other significant sources of revenue other than the sale of ethanol and its co-products, which include distillers’ grains and non-edible corn oil. Please refer to “ITEM 7 - MANAGEMENT’S DISCUSSION AND ANALYSIS OF FINANCIAL CONDITION AND RESULTS OF OPERATIONS” for information about our revenue, profit and loss measurements, and total assets and liabilities and “ITEM 8 - FINANCIAL STATEMENTS AND SUPPLEMENTARY DATA” for our consolidated financial statements and supplementary data. The principal products from ethanol production at GFE’s plant and HLBE’s plant, and from which we derive nearly all our revenue, are fuel-grade ethanol, distillers’ grains, and non-edible corn oil. In addition, HLBE’s plant also has miscellaneous other revenue generated by sales of corn syrup, a by-product of the ethanol production process, and revenues from Agrinatural’s natural gas pipeline operations. We did not introduce any new products or services as part of our ethanol production segment during our fiscal year ended October 31, 2018. The table below shows the approximate percentage of our total revenue which is attributable to each of our principal products for each of the last three fiscal years. *Includes incidental sales of corn syrup at HLBE’s plant and revenues from natural gas pipeline operations at Agrinatural, net of intercompany eliminations for distribution fees paid by HLBE to Agrinatural for natural gas transportation services. as a renewable fuel to displace consumption of imported oil. Ethanol produced in the U.S. is primarily used for blending with unleaded gasoline and other fuel products as an octane enhancer or fuel additive. Ethanol is most commonly sold as E10 (10% ethanol and 90% gasoline), which is the blend of ethanol approved by the U.S. Environmental Protection Agency (“EPA”) for use in all American automobiles. Increasingly, ethanol is also available as E85, a higher percentage ethanol blend (85% ethanol and 15% gasoline) approved by the EPA for use in flexible fuel vehicles. The principal co-product of the ethanol production process is distillers’ grains, a high protein and high-energy animal feed ingredient primarily marketed to the dairy and beef industries. Dry mill ethanol processing creates three primary forms of distillers’ grains: wet distillers’ grains, modified wet distillers’ grains, and dried distillers’ grains with solubles. Most of the distillers’ grains that we sell are in the form of dried distillers’ grains and modified/wet distillers’ grains. Modified/wet distillers’ grains are processed corn mash that has been dried to approximately 50% moisture and has a shelf life of approximately 7 days. Modified/wet distillers’ grains are often sold to nearby markets. Dried distillers’ grains with solubles are corn mash that has been dried to approximately 10% to 12% moisture. It has an almost indefinite shelf life and may be sold and shipped to any market and fed to almost all types of livestock. We also extract non-edible crude corn oil during the thin stillage evaporation process immediately prior to production of distillers’ grains. The corn oil that we produce is not food grade corn oil and therefore cannot be used for human consumption. Corn oil is used primarily as a biodiesel feedstock and as a supplement for animal feed. As described below in “Distribution of Principal Products”, we market and distribute all of GFE’s and HLBE’s ethanol, distillers’ grains, and corn oil through professional third party marketers. Our marketers make all decisions with regard to where our products are marketed and we have little control over the marketing decisions they make. Our ethanol, distillers’ grains and corn oil are primarily sold in the domestic market; however, as markets allow, our products can be, and have been, sold in the export markets. We expect our ethanol and distillers’ grains marketers to explore all markets for our products, including export markets. We believe that there is some potential for increased international sales of our products. Nevertheless, due to high transportation costs, and the fact that we are not located near a major international shipping port, we expect a majority of our products to continue to be marketed and sold domestically. The markets in which our ethanol is sold will depend primarily upon the efforts of Eco-Energy, Inc. (“Eco-Energy”), which buys and markets our ethanol. There are local, regional, national, and international markets for ethanol. The principal markets for our ethanol are petroleum terminals in the continental U.S. The principal purchasers of ethanol are generally wholesale gasoline distributors or blenders. We believe that local markets will be limited and must typically be evaluated on a case-by-case basis. Although local markets may be the easiest to service, they may be oversold because of the number of ethanol producers near our plants, which may depress the price of ethanol in those markets. Typically, a regional market is one that is outside of the local market, yet within the neighboring states. Some regional markets include large cities that are subject to anti-smog measures in either carbon monoxide or ozone non-attainment areas, or that have implemented oxygenated gasoline programs, such as Chicago, St. Louis, Denver, and Minneapolis. We consider our primary regional market to be large cities within a 450-mile radius of our ethanol plants. In the national ethanol market, the highest demand by volume is primarily in the southern U.S. and the east and west coast regions. We expect a majority of our ethanol to continue to be marketed and sold domestically. In addition, as domestic production of ethanol continues to expand, we anticipate increased international sales. Over our past fiscal year, exports of ethanol have increased with Brazil receiving the largest percentage of ethanol produced in the United States and Canada in second place. India, China, Netherlands, South Korea, and Philippines have also been top destinations. However, ethanol export demand is more unpredictable than domestic demand and tends to fluctuate over time as it is subject to monetary and political forces in other nations. For example, a strong US Dollar is a force that may negatively impact ethanol exports from the United States. Additionally, the imposition of tariffs and duties on imported ethanol from the U.S. can also negatively impact domestic export demand. Although exports to China substantially increased during 2016 over 2015, China imported comparatively negligible volumes during both 2017 and 2018. This reduction is due to China’s increase of the tariff on ethanol imported from the U.S. to 45% as of April 2, 2018, compared to the previous 30% tariff imposed in 2017, and the subsequent increase of the 45% tariff to 70% as of July 6, 2018. Notably, on September 13, 2017, China’s National Development and Reform Commission, the National Energy Board and 15 other state departments issued a joint plan to expand the use and production of biofuels containing up to 10% ethanol by 2020. It is unclear whether China will be able to meet the 10% target without importing US ethanol. However, there is no assurance the recently issued joint plan will lead to increased imports of US ethanol. to Brazil have remained steady from our 2017 fiscal year to our 2018 fiscal year. However, this tariff may continue to have a negative impact on the export market demand and prices for ethanol produced in the United States. We transport our ethanol primarily by rail. In addition to rail, we service certain regional markets by truck from time to time. We believe that regional pricing tends to follow national pricing less the freight difference. We sell distillers’ grains as animal feed for beef and dairy cattle, poultry, and hogs. Most of the distillers’ grains that we sell are in the form of dried distillers’ grains. Currently, the U.S. ethanol industry exports a significant amount of dried distillers’ grains, which may increase as worldwide acceptance grows. According to the U.S. Grains Council, total U.S. distiller’s grains exports through October 2018 were approximately 7.7% higher than distiller’s grains exports for the same period last year. Top export markets include Mexico, the European Union, Vietnam, Thailand, and South Korea. Historically, the United States ethanol industry exported a significant amount of distillers’ grains to China and Vietnam. However, during 2016, China began an anti-dumping and countervailing duty investigation related to distillers’ grains imported from the U.S. which contributed to a decline in distillers’ grains shipped to China during 2016. In January 2017, the Chinese issued final tariffs on U.S. distillers’ grains. The Chinese distillers’ grains anti-dumping tariffs range from 42.2% to 53.7% and the anti-subsidy tariffs range from 11.2% to 12%. The imposition of these duties has resulted in a significant decline in demand from this top importer requiring U.S. producers to seek out alternative markets. Exports to China within the last year have grown markedly but are still substantially below the pre-tariff export level. There is no guarantee that distillers’ grains exports to Chinese will resume. We also sell modified wet distillers’ grains, which typically have a shelf life of a maximum of seven days. This provides for a much smaller, more local market and makes the timing of its sale critical. Further, because of its moisture content, the modified wet distillers’ grains are heavier and more difficult to handle. The customer must be close enough to justify the additional handling and shipping costs. As a result, modified wet distillers’ grains are principally sold only to local feedlots and livestock operations. Various factors affect the price of distillers’ grain, including, among others, the price of corn, soybean meal and other alternative feed products, the performance or value of distillers’ grains in a particular feed market, and the supply and demand within the market. Like other commodities, the price of distillers’ grains can fluctuate significantly. Our corn oil is primarily sold to diesel manufacturers and, to a lesser extent, feed lot and poultry markets. We generally transport our corn oil by truck to users located primarily in the upper Midwest. GFE’s ethanol plant is located near Granite Falls, Minnesota, in Chippewa County. It is served by the TC&W Railway which provides connection to the Canadian Pacific and Burlington Northern Santa Fe Railroads. The completion of our rail loop during our 2012 fiscal year enables us to load unit trains. Our site is in close proximity to major highways that connect to major population centers such as Minneapolis, Minnesota; Chicago, Illinois; and Detroit, Michigan. HLBE’s ethanol plant is located near Heron Lake, Minnesota. It is served by the Union Pacific Railroad. HLBE’s site is also in close proximity to major highways that connect to major population centers such as Minneapolis, Minnesota; Chicago, Illinois; and Detroit, Michigan. ethanol sold, as well as a fixed lease fee for rail cars leased from Eco-Energy. The marketing fee and timing of payments by Eco-Energy were negotiated based on prevailing market-rate conditions for comparable ethanol marketing services. Our agreements with Eco-Energy expire on December 31, 2019. However, the agreements provide for automatic renewals for three additional terms of three-years each unless terminated by either party by providing written notice to the other party at least 90 days prior to the end of the then current term. RPMG, Inc. (“RPMG”) is the distillers’ grains marketer for our Granite Falls plant. Pursuant to GFE’s distillers’ grains marketing agreement, RPMG markets all the distillers’ grains produced at the Granite Falls plant. The contract commenced on February 1, 2011, with an initial term of one year, and will continue in effect until terminated by either party at its unqualified option, by providing written notice of not less than 90 days to the other party. Gavilon Ingredients, LLC (“Gavilon”) is the distillers’ grains marketer for HLBE. Under HLBE’s distillers’ grains marketing agreement, Gavilon purchases all of the distillers’ grains produced at our Heron Lake ethanol plant in exchange for a service fee. The contract commenced on November 1, 2013 with an initial term of six months, and will continue to remain in effect until terminated by either party at its unqualified option, by providing written notice of not less than 60 days to the other party. RPMG is also the corn oil marketer for both the GFE plant and the HLBE plant. Currently, RPMG markets our corn oil, which is used primarily as a biodiesel feedstock and as a supplement for animal feed. We pay RPMG a commission based on each pound of corn oil sold by RPMG under these marketing agreements. The contract for GFE commenced on April 29, 2010, and the contract for HLBE commenced on November 1, 2013. Both contracts have an initial term of one year, and will continue in effect until terminated by either party at its unqualified option, by providing written notice of not less than 90 days to the other party. As discussed above, we have exclusive ethanol marketing agreements with Eco-Energy. Additionally, we have agreements with RPMG and Gavilon to market all of the distillers’ grains produced at GFE’s plant and HLBE’s plant, respectively, and with RPMG to market all of the corn oil produced at our plants. We rely on Eco-Energy, RPMG and Gavilon for the sale and distribution of all of our products; therefore, we are highly dependent on Eco-Energy, RPMG and Gavilon for the successful marketing of our products. Any loss of these companies as our marketing agents for our ethanol, distillers’ grains, or corn oil could have a negative impact on our revenues. We experience some seasonality of demand for our ethanol. Since ethanol is predominantly blended with conventional gasoline for use in automobiles, ethanol demand tends to shift in relation to gasoline demand. As a result, we experience some seasonality of demand for ethanol in the summer months related to increased driving. In addition, we experience some increased ethanol demand during holiday seasons related to increased gasoline demand. We expect that ethanol sales will represent our primary revenue source and corn will represent our primary component of cost of goods sold. Therefore, changes in the price at which we can sell the ethanol we produce and the price at which we buy corn for our ethanol plants present significant operational risks inherent in our business. Trends in ethanol prices and corn prices are subject to a number of factors and are difficult to predict. price of ethanol increasing as supplies of petroleum decreased or appeared to be threatened, crude oil prices increased and wholesale gasoline prices increased. However, the prices of both ethanol and corn do not always follow historical trends. Generally, higher corn prices will produce lower profit margins and, therefore, negatively affect our financial performance. If a period of high corn prices were to be sustained for some time, such pricing may reduce our ability to operate profitably because of the higher cost of operating our plants. Because the market price of ethanol is not directly related to corn prices, we, like most ethanol producers, are not able to compensate for increases in the cost of corn through adjustments in our prices for our ethanol although we do see increases in the prices of our distillers’ grains during times of higher corn prices. Given that ethanol sales comprise a majority of our revenues, our inability to adjust our ethanol prices can result in a negative impact on our profitability during periods of high corn prices. Ethanol prices were lower during fiscal year 2018 compared to fiscal year 2017. Ethanol prices were lower during the fiscal year ended October 31, 2018 due to increased ethanol output and excess supply. Management expects additional volatility for the price of ethanol in 2019. Ethanol supply is projected to level out in 2019, and demand is expected to increase in 2019. However, there is no guarantee that either of these patterns will occur. Due to low ethanol and feedstock prices, exports grew in 2018 and are projected to continue to grow in 2019. This is positive for the ethanol industry, but does introduce additional risk as international demand is more volatile than domestic demand. U.S. gas demand was flat year over year in 2018, while ethanol as a percentage of the fuel supply remained steady. Ethanol consumption is projected to increase slightly in 2019; however, there is no guarantee that this projection will be accurate. A decrease in demand for either gasoline or ethanol blends would adversely impact the price of ethanol, which could result in a material adverse effect on our business, results of operations and financial condition. The primary raw materials used in the production of ethanol at our plants are corn and natural gas. Our plants also require significant and uninterrupted amounts of electricity and water. Ethanol production requires substantial amounts of corn. The cost of corn represented approximately 71.4%, 72.2%, and 74.1% of our cost of goods sold for the years ended October 31, 2018, 2017, and 2016, respectively. At GFE’s current production rate of approximately 63 million gallons of undenatured ethanol per year, the GFE plant requires approximately 21.5 million bushels of corn per year. The HLBE ethanol plant requires approximately 22.5 million bushels of corn per year to operate at its current production rate of approximately 65 million gallons of undenatured ethanol per year. GFE had an exclusive corn storage and grain handling agreement with Farmers Cooperative Elevator (“FCE”), a member of GFE. Under the agreement, GFE had agreed to purchase all of the corn needed for the operation of the plant from FCE. The price of the corn purchased was the bid price FCE establishes for the plant plus a set fee per bushel. On February 27, 2017, GFE and FCE executed an amendment to the corn storage and grain handling agreement. Pursuant to the terms of the amendment, GFE and FCE agreed to amend the corn storage and grain handling agreement to accelerate the termination date of the agreement to midnight August 31, 2017. In exchange for the early termination, GFE paid an early termination fee to FCE of approximately $255,000 in August 2017. Prior to the amendment, the termination date of the corn storage and grain handling agreement was set to expire on November 2017. On June 1, 2017, GFE began posting bids for the purchase of corn directly from grain elevators, farmers, and local dealers within approximately 80 miles of Granite Falls, Minnesota. On September 1, 2017, GFE began accepting delivery of corn at its Granite Falls plant. Typically, HLBE purchases its corn directly from grain elevators, farmers, and local dealers within approximately 80 miles of Heron Lake, Minnesota. Neither GFE’s nor HLBE’s members are obligated to deliver corn to the Granite Falls plant or Heron Lake plant. contracts, producers will deliver corn to either the GFE or HLBE plant, but the pricing for that corn and the related payment will occur at a later date. We may also purchase a portion of our corn on a spot basis. For our spot purchases, GFE and HLBE post daily corn bids so that corn producers can sell to directly to our plants on a spot basis. In addition, both plants’ facilities have sufficient corn storage capacity, with the capability to store approximately 8 days of corn supply at HLBE and approximately 18 days of corn supply at the GFE plant. We compete with ethanol producers in close proximity for the supplies of corn we will require to operate our plants. There are 8 ethanol plants within an approximate 50 mile radius of HLBE’s plant and 5 ethanol plants within an approximate 50 mile radius of the GFE plant. The existence of other ethanol plants, particularly those in close proximity to our plants, increase the demand for corn and may result in higher costs for supplies of corn. We also compete with other users of corn, including ethanol producers regionally and nationally, producers of food and food ingredients for human consumption (such as high fructose corn syrup, starches, and sweeteners), producers of animal feed and industrial users. Since corn is the primary raw material we use to produce our products, the availability and cost of corn can have a significant impact on the profitability of our operations. Corn prices were lower during the first, second, and third quarters of our 2018 fiscal year, as compared to our 2017 fiscal year, as a result of several consecutive years of favorable corn crops. Corn prices were higher during the fourth quarter of our 2018 fiscal year, as compared to our 2017 fiscal year, due to strong demand and potential weather threats. If we experience a drought or other unfavorable weather condition during our 2019 fiscal year, the price we pay for corn and the availability of corn near our plants could be negatively impacted. If we experience a localized shortage of corn, we may be forced to purchase corn from producers who are farther away from our ethanol plants which can increase our transportation costs. Natural gas is a significant input to our manufacturing process. The cost of natural gas represented approximately 6.0%, 6.3%, and 5.1%, of our cost of sales for the years ended October 31, 2018, 2017, and 2016, respectively. We do not anticipate any problems securing the natural gas we require to continue to operate our plants at capacity during our 2019 fiscal year or beyond. At GFE’s plant, we pay Center Point Energy/Minnegasco a per unit fee to move the natural gas through the pipeline, and we have guaranteed to move a minimum of 1,500,000 mmBTU annually through December 31, 2025, which is the ending date of the agreement. GFE also has an agreement with Kinetic Energy Group. On our behalf, Kinetic Energy Group procures contracts with various natural gas vendors to supply the natural gas necessary to operate the GFE plant. We determined that sourcing our natural gas from a variety of vendors is more cost-efficient than using an exclusive supplier. HLBE has a facilities agreement with Northern Border Pipeline Company, which allows HLBE to access an existing interstate natural gas pipeline located approximately 16 miles north from its plant. HLBE has entered into a firm natural gas transportation agreement with its majority owned subsidiary, Agrinatural. Under the terms of the firm natural gas transportation agreement, Agrinatural will provide natural gas to the HLBE plant with a specified price per MMBTU for a term ending on October 31, 2021, with an automatic renewal option for an additional five year period. HLBE also has a base agreement for the sale and purchase of natural gas with Constellation NewEnergy—Gas Division, LLC (“Constellation”). HLBE buys all of its natural gas from Constellation and this agreement runs through March 31, 2022. The prices for and availability of natural gas are subject to volatile market conditions. These market conditions often are affected by factors beyond our control such as higher prices as a result of colder than average weather conditions or natural disasters, overall economic conditions and foreign and domestic governmental regulations and relations. Significant disruptions in the supply of natural gas could impair our ability to manufacture ethanol and more significantly, dried distillers’ grains for our customers. Furthermore, increases in natural gas prices or changes in our natural gas costs relative to natural gas costs paid by competitors may adversely affect our results of operations and financial condition. Our plants require a continuous supply of electricity. We have agreements in place to supply electricity to our plants. Our GFE plant obtains electricity from Minnesota Valley Light and Power Cooperative, and our HLBE plant obtains electricity from Federated Rural Electric. We do not anticipate any problems securing the electricity that we require to continue to operate our plants at capacity during our 2019 fiscal year or beyond. We do not anticipate any problems securing the water that we require to continue to operate our plants at capacity during our 2019 fiscal year or beyond. GFE obtains the water necessary to operate its plant from the Minnesota River with an adjustable gravity-flow intake system. HLBE obtains its water pursuant to an industrial water supply agreement with the City of Heron Lake and Jackson County, Minnesota. The profitability of our operations is highly dependent on the impact of market fluctuations associated with commodity prices. We use various derivative instruments as part of an overall strategy to manage market risk and to reduce the risk that our ethanol production will become unprofitable when market prices among our principal commodities and products do not correlate. In order to mitigate our commodity and product price risks, we enter into hedging transactions, including forward corn, ethanol, distillers’ grains and natural gas contracts, in an attempt to partially offset the effects of price volatility for corn and ethanol. However, we are not always presented with an opportunity to lock in a favorable margin and our plant’s profitability may be negatively impacted during periods of high grain prices. We also enter into over-the-counter and exchange-traded futures, swaps and option contracts for corn, ethanol and distillers’ grains, designed to limit our exposure to increases in the price of corn and manage ethanol price fluctuations. Although we believe that our hedging strategies can reduce the risk of price fluctuations, the financial statement impact of these activities depends upon, among other things, the prices involved and our ability to physically receive or deliver the commodities involved. Our hedging activities could cause net income to be volatile from quarter to quarter due to the timing of the change in value of the derivative instruments relative to the cost and use of the commodity being hedged. As corn and ethanol prices move in reaction to market trends and information, our income statement will be affected depending on the impact such market movements have on the value of our derivative instruments. Hedging arrangements expose us to the risk of financial loss in situations where the counterparty to the hedging contract defaults or, in the case of exchange-traded contracts, where there is a change in the expected differential between the price of the commodity underlying the hedging agreement and the actual prices paid or received by us for the physical commodity bought or sold. There are also situations where the hedging transactions themselves may result in losses, as when a position is purchased in a declining market or a position is sold in a rising market. Hedging losses may be offset by a decreased cash price for corn and natural gas and an increased cash price for ethanol and distillers’ grains. We have established a risk management committee which assists the board and our risk management manager to, among other things, establish appropriate policies and strategies for hedging and enterprise risk. We continually monitor and manage our commodity risk exposure and our hedging transactions as part of our overall risk management policy. As a result, we may vary the amount of hedging or other risk mitigation strategies we undertake, and we may choose not to engage in hedging transactions. Our ability to hedge is always subject to our liquidity and available capital. We are continually working to develop new methods of operating the ethanol plants more efficiently. We continue to conduct process improvement activities in order to realize these efficiency improvements. We do not currently hold any patents, trademarks, franchises, or concessions. We were granted a license by ICM, Inc. (“ICM”) to use certain ethanol production technology necessary to operate our ethanol plants. The cost of the license granted by ICM was included in the amount we paid to Fagen, Inc. to design and build our ethanol plants. We sell our ethanol in a highly competitive market. Ethanol is a commodity product where competition in the industry is predominantly based on price. On a national scale, we are in direct competition with numerous other ethanol producers. According to the Renewable Fuels Association (“RFA”), as of November 15, 2018, there are approximately 217 biorefineries with a total nameplate capacity of approximately 16.5 billion gallons of ethanol per year, with an additional eight plants under expansion or construction with capacity to produce an additional 258 million gallons. However, the RFA estimates that approximately 3.2% of the ethanol production capacity in the U.S. was not operating as of November 15, 2018. The following table identifies the top five largest ethanol producers in the U.S. along with their production capacities. Each of the large ethanol producers above are capable of producing significantly more ethanol than we produce. These producers and other large producers are, among other things, capable of producing a significantly greater amount of ethanol or have multiple ethanol plants that may help them achieve certain benefits that we could not achieve with one ethanol plant. This could put us at a competitive disadvantage to other ethanol producers. Larger ethanol producers may have an advantage over us from economies of scale and stronger negotiating positions with purchasers. Large producers own multiple ethanol plants and may have flexibility to run certain facilities while shutting or slowing down production at their other facilities. This added flexibility may allow these producers to compete more effectively, especially during periods when operating margins are unfavorable in the ethanol industry. Some large producers own ethanol plants in geographically diverse areas of the U.S. and as result, may be able to more effectively spread the risk they encounter related to feedstock prices. Some of our competitors are owned subsidiaries of larger oil companies, such as Valero Renewable Fuels and Flint Hills Resources. Because their parent oil companies are required to blend a certain amount of ethanol each year, these competitors may be able to operate their ethanol production facilities at times when it is unprofitable for us to operate our ethanol plant. Further, new products or methods of ethanol production developed by larger and better-financed competitors could provide them competitive advantages over us and harm our business. A majority of the U.S. ethanol plants, and therefore, the greatest number of gallons of ethanol production capacity, are concentrated in the corn-producing states of Iowa, Nebraska, Illinois, Indiana, Minnesota, South Dakota, Ohio, Wisconsin, Kansas, and North Dakota. According to the RFA, as of November 15, 2018, Minnesota is one of the top producers of ethanol in the U.S. with 22 ethanol plants producing an aggregate of approximately 1.3 billion gallons of ethanol per year. Therefore, we face increased regional and local competition because of the location of our ethanol plant. Eco-Energy markets out ethanol primarily on a regional and national basis. We compete with other ethanol producers both for markets in Minnesota and markets in other states. We believe that we are able to reach the best available markets through the use of our experienced marketer and by the rail delivery methods we use. We believe that we can compete favorably with other ethanol producers due to our proximity to ample grain, natural gas, electricity and water supplies at favorable prices. In addition to intense competition with domestic producers of ethanol, we have faced increased competition from ethanol produced in foreign countries. Depending on feedstock prices, ethanol imported from foreign countries may be less expensive than domestically-produced ethanol. However, foreign demand, transportation costs and infrastructure constraints may temper the market impact on the U.S. Ethanol imports have been lower in recent years and ethanol exports have been higher. However, if demand for imported ethanol were to increase again, demand for domestic ethanol may be reduced, which could lead to lower domestic prices and lower operating margins. Large international companies with much greater resources than ours have developed, or are developing, increased foreign ethanol production capacities. Many international suppliers produce ethanol primarily from inputs other than corn, such as sugar cane, and have cost structures that may be substantially lower than U.S. based ethanol producers including us. Many of these international suppliers are companies with much greater resources than us with greater production capacities. Alternative fuels and alternative ethanol production methods are continually under development. New ethanol products or methods of ethanol production developed by larger and better-financed competitors could provide them competitive advantages over us and harm our business. We anticipate increased competition from renewable fuels that do not use corn as the feedstock. Many of the current ethanol production incentives are designed to encourage the production of renewable fuels using raw materials other than corn. One type of ethanol production feedstock that is being explored is cellulose. Cellulose is found in wood chips, corn stalks and rice straw, amongst other common plants. Several companies and researchers have commenced pilot projects to study the feasibility of commercially producing cellulosic ethanol. A few companies have completed commercial scale cellulosic ethanol plants. If this technology can be profitably employed on a commercial scale, it could potentially lead to ethanol that is less expensive to produce than corn based ethanol. Cellulosic ethanol may also capture more government subsidies and assistance than corn based ethanol. This could decrease demand for our product or result in competitive disadvantages for our ethanol production process. In addition to competing with ethanol producers, we also compete with producers of other gasoline oxygenates. Many gasoline oxygenates are produced by other companies, including oil companies. The major oil companies have significantly greater resources than we have to develop alternative products and to influence legislation and public perception of ethanol. Historically, as a gasoline oxygenate, ethanol primarily competed with two gasoline oxygenates, both of which are ether-based: MTBE (methyl tertiary butyl ether) and ETBE (ethyl tertiary butyl ether). While ethanol has displaced these two gasoline oxygenates, the development of ethers intended for use as oxygenates is continuing and we will compete with producers of any future ethers used as oxygenates. A number of automotive, industrial and power generation manufacturers are developing alternative fuels and clean power systems using fuel cells, plug-in hybrids, electric cars or clean burning gaseous fuels. Electric car technology has recently grown in popularity, especially in urban areas. While there are currently a limited number of vehicle recharging stations, there has been increased focus on developing these recharging stations to make electric car technology more feasible and widely available in the future. Additional competition from these other sources of alternative energy, particularly in the automobile market, could reduce the demand for ethanol, which would negatively impact our profitability. The amount of distillers’ grains produced annually in North America has increased significantly as the number of ethanol plants increased. We compete with other producers of distillers’ grains products both locally and nationally, with more intense competition for sales of distillers’ grains among ethanol producers in close proximity to our ethanol plant. These competitors may be more likely to sell to the same markets that we target for our distillers’ grains. Distillers’ grains are primarily used as an animal feed, competing with other feed formulations using corn and soybean meal. As a result, we believe that distillers’ grains prices are positively impacted by increases in corn and soybean prices. In recent years the U.S. ethanol industry has increased exports of distillers’ grains which management believes has positively impacted demand and prices for distillers’ grains in the U.S. However, with the recent imposition of Chinese import duties on U.S. distillers’ grains, distillers’ grains exports have been negatively impacted, increasing the domestic supply of distillers’ grains. Increased domestic supply has had a corresponding negative impact on distillers’ grains prices and has decreased the price of distillers’ grains as compared to a comparable volume of corn. In the event these distillers’ grains exports continue to decrease, it could result in increased competition among ethanol producers for sales of distillers’ grains and could negatively impact distillers’ grains prices in the U.S.
We compete with many ethanol producers for the sale of corn oil. Many ethanol producers have installed the equipment necessary to separate corn oil from the distillers’ grains they produce which has increased competition for corn oil sales and has resulted in lower market corn oil prices. The ethanol industry is dependent on several economic incentives to produce ethanol, the most significant of which is the federal Renewable Fuels Standard (the “RFS”). The RFS is a national program that does not require that any renewable fuels be used in any particular area or state, allowing refiners to use renewable fuel blends in those areas where it is most cost-effective. The RFS has been, and we expect will continue to be, a significant factor impacting ethanol usage. Under the RFS, the EPA is supposed to pass an annual rule that establishes the number of gallons of different types of renewable fuels that must be used in the U.S. by refineries, blenders, distributors and importers which is called the renewable volume obligations (“RVOs”). The EPA has the authority to waive the mandates in whole or in part if one of two conditions is met: 1) there is inadequate domestic renewable fuel supply, or 2) implementation of the mandate requirement severely harms the economy or environment of a state, region or the U.S. The RFS sets the statutory RVO for corn-based ethanol at 15 billion gallons beginning in 2016 and each year thereafter through 2022. On November 30, 2018, the EPA announced the final rule for 2018 RVOs, which was set at 15.0 billion gallons for corn-based ethanol. This rule is set at 100% of the original conventional biofuel requirement of 15.0 billion gallons, and is considered a favorable outcome by the industry. The 2018 final rule also set advanced biofuels at 4.29 billion gallons, for overall RVOs of 19.29 billion gallons for 2018. On November 30, 2018, the EPA announced the final 2019 RVOs, setting the RVOs for conventional ethanol at 15.0 billion gallons, advanced biofuels at 4.92 billion gallons and cellulosic ethanol at 0.42 billion gallons, for overall RVOs of 19.92 billion gallons for 2019. Although this final rule achieves the statutory RVO for conventional corn-based ethanol originally set by Congress when the RFS was enacted, it reduces the overall RVOs below the overall statutory level of 26 billion gallons. (1)Final EPA RFS RVOs for 2017 issued November 2016. (2)Final EPA RFS RVOs for 2018 issued November 2017. (3)Final EPA RFS RVOs for 2019 issued November 2018. Current ethanol production capacity exceeds the EPA’s 2018 and 2019 RVOs that can be satisfied by corn-based ethanol. According to the RFS, if mandatory renewable fuel volumes are reduced by at least 20% for two consecutive years, the EPA is required to modify, or reset, statutory volumes through 2022. In October 2018, the Office of Management and Budget announced that the 20% thresholds “have been met or are expected to be met in the near future.” As a result, the EPA is proposing a rulemaking that will propose modifying the applicable volumes targets for cellulosic biofuel, advanced biofuel, and total renewable fuels for the years 2020-2022. Additionally, the EPA will be proposing volume requirements for biomass-based diesel for 2021 and 2022. Because the timetable for the rulemaking overlaps with the annual standard-setting rulemakings, the rulemaking will also include the applicable percentage standards for 2020. If the statutory RVOs are reduced as a result of reset, it could have an adverse effect on the market price and demand for ethanol which would negatively impact our financial performance. Beginning in January 2016, various ethanol and agricultural industry groups petitioned a federal appeals court to hear a legal challenge to of the EPA’s decision to reduce the total renewable fuel volume requirements for 2014-2016 through use of its “inadequate domestic supply” waiver authority. On July 28, 2017, the U.S. Court of Appeals for the D.C. Circuit ruled in favor of the petitioners, concluding that the EPA erred in its exercise of “inadequate domestic supply” waiver authority by considering demand-side constraints. As a result, the Court vacated the EPA’s decision to reduce the total renewable fuel volume requirements for 2016, and remanded to the EPA to address the 2016 total renewable fuels volume requirements. While management believes the decision should benefit the ethanol industry overall by clarifying the EPA's waiver analysis is limited to consideration of supply-side factors only, no direct impact on the Company is expected from the decision. Management anticipates that there will be further legal challenges to the EPA's reduction in the volume requirements, including the final rules for 2017, 2018, and 2019. However, if the EPA's decision to reduce the volume requirements under the RFS is allowed to stand, or if the volume requirements are further reduced, it could have an adverse effect on the market price and demand for ethanol which would negatively impact our financial performance. Beyond the federal mandates, there are limited domestic markets for ethanol. Further, opponents of ethanol such as large oil companies will likely continue their efforts to repeal or reduce the RFS through lawsuits or lobbying of Congress. If such efforts are successful in further reducing or repealing the blending requirements of the RFS, a significant decrease in ethanol demand may result and could have a material adverse effect on our results of operations, cash flows and financial condition, unless additional demand from exports or discretionary or E85 blending develops. the U.S. and it discounts the possibility of additional ethanol used in higher percentage blends such as E15 and E85. These higher percentage blends may lead to additional ethanol demand if they become more widely available and accepted by the market. There is growing availability of E85 for use in flexible fuel vehicles, however it is limited due to lacking infrastructure. In addition, the industry has been working to introduce E15 to the retail market since the EPA approved its use vehicles model year 2001 and newer. However, wide spread adoption of E15 is hampered by regulatory and infrastructure hurdles in many states, as well as consumer acceptance. Additionally, sales of E15 may be limited because: (i) it is not approved for use in all vehicles; (ii) the EPA requires a label that management believes may discourage consumers from using E15; and (iii) retailers may choose not to sell E15 due to concerns regarding liability. In addition, different gasoline blendstocks may be required at certain times of the year in order to use E15 due to federal regulations related to fuel evaporative emissions. This may prevent E15 from being used during certain times of the year in various states. However, in October 2018, President Trump directed the EPA to promulgate a regulation making E15 available year-round. The Office of Management and Budget expects that the EPA will release a proposed rule in February 2019, with the final rule scheduled to be issued in May 2019. Notably, much of the EPA’s staff was subject to furlough due to a partial government shutdown in January 2019. It is also important to note that the oil industry is expected to challenge this rulemaking. As a result, there is no guarantee that the year-round E15 rule will be finalized pursuant to the proposed timeline, nor is there a guarantee that the rule will ever be finalized. Obligated parties use renewable identification numbers (“RINs”) to show compliance with RFS-mandated volumes. RINs are attached to renewable fuels by producers and detached when the renewable fuel is blended with transportation fuel or traded in the open market. The market price of detached RINs affects the price of ethanol in certain markets and influences the purchasing decisions by obligated parties. Under the RFS, small refineries may petition for and be granted temporary exemptions from the RVOs if they can demonstrate that compliance with the RVOs would cause disproportionate economic hardship. Waivers granted in 2016 and 2017 effectively lowered the RVOs by at least 1.6 billion gallons, according to the Renewable Fuels Association. On December 20, 2018, the EPA released data on the number of waivers filed, which indicated that, as of December 18, 2018, 22 petitions for waivers for the 2018 compliance year have been received. For the 2017 compliance year, 37 petitions have been received. To date, the EPA has approved 29 of those petitions, with 7 currently pending and 1 declared ineligible or withdrawn. The 29 approved petitions have exempted approximately 1.46 billion RINs, which is approximately 13.62 billion gallons of gasoline and diesel, from meeting the RFS blending targets. It is expected that additional petitions for waivers for the 2018 compliance year will be received by the EPA. It is also expected that the EPA will approve a significant number of these waiver petitions, thereby exempting a substantial number of gallons of gasoline and diesel from meeting the RFS blending targets. These exemptions decrease demand for our products, which negatively impacts ethanol prices and our profitability. Our business subjects us to various federal, state, and local environmental laws and regulations, including: those relating to discharges into the air, water, and ground; the generation, storage, handling, use, transportation, and disposal of hazardous materials; and the health and safety of our employees. These laws and regulations require us to obtain and comply with numerous permits to construct and operate our ethanol plants, including water, air, and other environmental permits. The costs associated with obtaining these permits and meeting the conditions of these permits have increased our costs of construction and production. Additionally, compliance with environmental laws and permit conditions in the future could require expensive pollution control equipment or operational changes to limit actual or potential impacts to the environment, as well as significant management time and expense. A violation of these laws, regulations or permit conditions can result in substantial fines, natural resource damage, criminal sanctions, permit revocations, and/or plant shutdown, any of which could have a material adverse effect on our operations. Although violations and environmental non-compliance still remain a possibility following our conversion from coal to natural gas combustion, the exposure to the company has been greatly reduced. stipulation agreement with MPCA relating to the non-compliant test results. Under the stipulation agreement, HLBE agreed to pay a civil penalty of $63,500, which was paid in October 2017. In the fiscal year ended October 31, 2018, GFE and HLBE incurred costs and expenses of approximately $102,000 and $133,000 respectively, complying with environmental laws, including HLBE’s civil penalty for non-compliance. Although we have been successful in obtaining all of the permits currently required to operate our plants, any retroactive change in environmental regulations, either at the federal or state level, could require us to obtain additional or new permits or spend considerable resources in complying with such regulations. On January 13, 2015 and March 30, 2015, HLBE and GFE, respectively, submitted efficient producer petitions to the EPA. The EPA awarded efficient producer pathway approval to HLBE and GFE on March 12, 2015 and May 13, 2015, respectively. In the approval determinations, the EPA’s analysis indicated that HLBE achieved at least a 20.1% reduction and GFE achieved a 26.0% reduction in greenhouse gas (“GHG”) emissions for their non-grandfathered volumes compared to the baseline lifecycle GHG emissions. Pursuant to the award approval, HLBE and GFE are only authorized to generate RINs for each plant’s non-grandfathered volumes if each plant can demonstrate that all ethanol produced at the plant during an averaging period (defined as the prior 365 days or the number of days since the date EPA efficient producer pathway approval) meets the 20% GHG reduction requirement. To make these demonstrations, HLBE and GFE must develop compliance plans and keep certain records as specified in the approvals. Additionally, the EPA approvals require that HLBE and GFE register with the EPA as a renewable fuel producer for the non-grandfathered volumes. Although we believe GFE and HLBE will be able to maintain continuous compliance with the 20% reduction in GHG emissions requirement, there is no guarantee that we will do so. If GFE or HLBE do not maintain continuous compliance with the 20% reduction in GHG emissions requirement, we will not be able issue RINs for the non-grandfathered volumes of ethanol produced at the plants. As a result, we may be forced to rely on exports sales for these non-grandfathered volumes ethanol, which could adversely affect our operating margins, which, in turn could adversely affect our results of operations, cash flows and financial condition. The California Air Resources Board, or CARB, has adopted a Low Carbon Fuel Standard, or LCFS, requiring a 10% reduction in average carbon intensity of gasoline and diesel transportation fuels from 2010 to 2020. After a series of rulings that temporarily prevented CARB from enforcing these regulations, the federal appellate court reversed the federal district court finding the LCFS constitutional and remanding the case back to federal district court to determine whether the LCFS imposes a burden on interstate commerce that is excessive in light of the local benefits. On June 30, 2014, the United States Supreme Court declined to hear the appeal of the federal appellate court ruling and CARB recently re-adopted the LCFS with some slight modifications. The LCFS could have a negative impact on demand for corn-based ethanol and result in decreased ethanol prices affecting our ability to operate profitably. In February 2013, an anti-dumping tariff was imposed as a regulation by the Council of the European Union ethanol produced in the United States and exported to Europe. The Company does not export any ethanol to Europe at this time. However, continuation of this duty or imposition of tariffs by other countries or regions could reduce United States exports to Europe, and possibly other export markets. A reduction of exports to Europe could have an adverse effect on domestic ethanol prices, as the available supply of ethanol for the domestic market would increase. We compete with ethanol producers in close proximity for the personnel we will require to operate our plants. The existence and development of other ethanol plants will increase competition for qualified managers, engineers, operators and other personnel. We also compete for personnel with businesses other than ethanol producers and with businesses located within the Granite Falls and Heron Lake, Minnesota communities. As of the date of this report, we have 82 full time employees at our two consolidated ethanol plants, of which 42 are employed at the GFE plant and 40 are employed at the HLBE plant. Of our total employees, 17 are involved primarily in management and administration with 10 employees at the GFE plant and 7 at the HLBE plant. The remaining employees are involved primarily in plant operations. We do not currently anticipate any significant change in the number of employees at our plants. On July 31, 2013, GFE entered into a management services agreement with HLBE. Pursuant to the management services agreement, GFE provides its chief executive officer, chief financial officer, and commodity risk manager to act in those positions as part-time officers and managers of HLBE. Each person providing management services to HLBE under the management services agreement is subject to oversight by the HLBE board of governors. However, GFE’s chief executive officer is solely responsible for hiring and firing persons providing management services under the management services agreement. The term of the management services agreement automatically renews for successive one-year terms until either party gives the other party written notice of termination prior to expiration of the then current term. The management services agreement may also be terminated by either party for cause under certain circumstances. GFE is responsible for and agreed to directly pay salary, wages, and/or benefits to the persons providing management services under the management services agreement. Under the terms of the management services agreement, HLBE pays GFE 50% of the total salary, bonuses and other expenses and costs (including all benefits and tax contributions) incurred by GFE for the three management positions, paid on an estimated monthly basis with a “true-up” following the close of our fiscal year. All of our operations are domiciled in the U.S. All of the products sold to our customers for fiscal years 2018, 2017, and 2016 were produced in the U.S. and all of our long-lived assets are domiciled in the U.S. We have engaged third-party professional marketers who decide where our products are marketed and we have no control over the marketing decisions made by our third-party professional marketers. These third-party marketers may decide to sell our products in countries other than the U.S. However, we anticipate that our products will primarily be sold in the U.S.
On November 1, 2016, we subscribed to purchase 1,500 capital units of Ring-neck Energy & Feed, LLC (“Ringneck”) at a price of $5,000 per unit for a total of $7,500,000. We paid a down payment of $750,000 in connection with our subscription, and signed a promissory note for $6,750,000 for the remaining balance of the subscription. By letter dated July 12, 2017, GFE was notified of Ringneck’s acceptance of GFE’s subscription and that payment of the balance of GFE’s subscription due under the promissory note was due no later than August 2, 2017. On August 2, 2017, GFE borrowed $7.5 million under its credit facility with Project Hawkeye, LLC (“Project Hawkeye”), an affiliate of Fagen, Inc., which is a member of GFE, and paid the remaining balance due on GFE’s subscription of $6,750,000 to Ringneck. Details of the Project Hawkeye credit facility are provided below in the section below entitled “PART II - ITEM 7. MANAGEMENT’S DISCUSSION AND ANALYSIS OF FINANCIAL CONDITION AND RESULTS OF OPERATIONS - Credit Arrangements”. Ringneck is a South Dakota limited liability company that intends to build an 80 million gallon per year ethanol manufacturing plant in outside of Onida, South Dakota in Sully County. GFE’s investment is sufficient to grant it the right to appoint one director to the board of directors of Ringneck and GFE has appointed Steve Christensen, its CEO, to serve as its appointed director. The units we acquired in Ringneck are subject to restrictions on transfer; therefore, this should not be considered a liquid investment. It may take a significant amount of time before we realize a return on our investment, if we realize a return on the investment at all. Ringneck offered its units pursuant to a private placement memorandum. Additionally, because Ringneck is not conducting a federally-registered offering, we do not expect that information about Ringneck will be available via the SEC’s EDGAR filing system. Therefore, it may be difficult for our investors to obtain information about Ringneck. In connection with our subscription, GFE entered into a credit facility with Project Hawkeye pursuant to which GFE borrowed $7.5 million to finance the investment in Ringneck. Details of the Project Hawkeye credit facility are provided below in the section below entitled “PART II - ITEM 7. MANAGEMENT’S DISCUSSION AND ANALYSIS OF FINANCIAL CONDITION AND RESULTS OF OPERATIONS - Credit Arrangements”. provides ethanol marketing, logistics, and trading services. Harvestone’s headquarters are located in Franklin, Tennessee. Harvestone is owned by several other ethanol producers and other private investors and expects that its primary business will be marketing and trading for member and non-member ethanol producers. Marketing and trading operations commenced in January 2019. GFE’s investment is sufficient to grant it the right to appoint one advisor to the advisory committee to the managers of Harvestone, and GFE has appointed Erik Baukol, its Risk Manager, to serve as its appointed advisor. The units we acquired in Harvestone are subject to restrictions on transfer; therefore, this should not be considered a liquid investment. It may take a significant amount of time before we realize a return on our investment, if we realize a return on the investment at all. Because Harvestone is not conducting a federally-registered offering, nor is it a registered reporting company with the SEC, we do not expect that information about Harvestone will be available via the SEC’s EDGAR filing system. Therefore, it may be difficult for our investors to obtain information about Harvestone. You should carefully read and consider the risks and uncertainties below and the other information contained in this report. The risks and uncertainties described below are not the only ones we may face. The following risks, together with additional risks and uncertainties not currently known to us or that we currently deem immaterial could impair our financial condition and results of operation. If any of the following risks actually occur, our results of operations, cash flows and the value of our units could be negatively impacted. Our business is not significantly diversified, and we may not be able to adapt to changing market conditions or endure any decline in the ethanol industry. Our success depends on our ability to efficiently produce and sell ethanol, and, to a lesser extent, distillers’ grains and corn oil. We do not have any other lines of business or other sources of revenue if we are unable to operate our ethanol plants and manufacture ethanol and its related co-products. Further, all of our investments are in companies involved in the ethanol industry. Our majority owned subsidiary, HLBE, operates a natural gas pipeline through Agrinatural, its majority owned subsidiary. Before and after accounting for intercompany eliminations, revenues from Agrinatural’s represent less than 1% of our consolidated revenues. Therefore, Agrinatural does not produce significant revenue to rely upon if we are unable to produce and sell ethanol and its co-products, or if the market for those products declines. As result, if economic or political factors adversely affect the market for ethanol and its co-products, we have no other line of business to fall back on. Our lack of diversification means that we may not be able to adapt to changing market conditions, changes in regulation, increased competition or any significant decline in the ethanol industry. Our business would also be significantly harmed if the ethanol plants could not operate at full capacity for any extended period of time. Our profitability depends upon purchasing corn at lower prices and selling ethanol at higher prices and because the difference between ethanol and corn prices can vary significantly, our financial results may also fluctuate significantly. The results of our ethanol production business are highly impacted by commodity prices. The substantial majority of our revenues are derived from the sale of ethanol. Our results of operations and financial condition are significantly affected by the cost and supply of corn and natural gas as our gross profit relating to the sale of ethanol is principally dependent on the difference between the price we receive for the ethanol we produce and the cost of corn and natural gas that we must purchase. Changes in the price and supply of corn and natural gas are subject to and determined by market forces over which we have no control, such as weather, domestic and global demand, shortages, export prices, and various governmental policies in the U.S. and around the world. As a result of price volatility for these commodities, our operating results may fluctuate substantially. Increases in corn or natural gas prices or decreases in ethanol, distillers’ grains and corn oil prices may make it unprofitable to operate our plants. No assurance can be given that we will be able to purchase corn and natural gas at, or near, current prices and that we will be able to sell ethanol, distillers’ grains and corn oil at, or near, current prices. Consequently, our results of operations and financial position may be adversely affected by increases in the price of corn or natural gas or decreases in the price of ethanol, distillers’ grains and corn oil. We seek to minimize the risks from fluctuations in the prices of corn and natural gas through the use of hedging instruments. However, these hedging transactions also involve risks to our business. If we were to experience relatively higher corn and natural gas costs compared to the selling prices of our products for an extended period of time, the value of our units may be reduced. Sustained negative operating margins may require some ethanol producers to temporarily limit or cease production. Our ability and the ability of other ethanol producers to operate profitably is largely determined by the spread between the price paid for corn and the price received for ethanol. If this spread is narrow or is negative for a sustained period, some ethanol producers may elect to temporarily limit or cease production until their possibility for profitability returns. Although we currently have no plans to limit or cease ethanol production, we may be required to do so if we experience a period of sustained negative operating margins. In such an event, we would still incur certain fixed costs, which would impact our financial performance. Volatility in oil and gas prices may materially affect ethanol pricing and demand. Ethanol has historically traded at a discount to gasoline. When ethanol trades at a discount to gasoline it encourages discretionary blending, thereby increasing the demand for ethanol beyond required blending rates. Conversely, when ethanol trades at a premium to gasoline, there is a disincentive for discretionary blending and ethanol demand is negatively impacted. Consequently, ethanol pricing and demand may also be volatile, which makes it difficult to manage profit margins and which could result in a material adverse effect on our business, results of operations and financial condition. If the supply of ethanol exceeds the demand for ethanol, the price we receive for our ethanol and distillers’ grains may decrease. Domestic ethanol production capacity has increased substantially over the past decade. However, demand for ethanol may not increase as quickly as expected or to a level that exceeds supply, or at all. Excess ethanol production capacity may result from decreases in the demand for ethanol or increased domestic production or imported supply. There are many factors affecting demand for ethanol, including regulatory developments and reduced gasoline consumption as a result of increased prices for gasoline or crude oil. Higher gasoline prices could cause businesses and consumers to reduce driving or acquire vehicles with more favorable gasoline mileage, or higher prices could spur technological advances, such as the commercialization of engines utilizing hydrogen fuel-cells, which could supplant gasoline-powered engines. There are a number of governmental initiatives designed to reduce gasoline consumption, including tax credits for hybrid vehicles and consumer education programs. Because ethanol production produces distillers’ grains as a co-product, increased ethanol production will also lead to increased production of distillers’ grains. An increase in the supply of distillers’ grains, without corresponding increases in demand, could lead to lower prices or an inability to sell our distillers’ grains production. A decline in the price of distillers’ grains or the distillers’ grains market generally could have a material adverse effect on our business, results of operations and financial condition. Management expects additional volatility for the price of ethanol in 2019. Ethanol supply is expected to level out or increase in 2019, and demand is expected to increase in 2019, which may lead to market imbalances. Due to low ethanol and feedstock prices, exports grew in 2018 and are projected to continue to grow in 2019. This is positive for the ethanol industry, but does introduce additional risk as international demand is more volatile than domestic demand. U.S. gas demand was flat year over year in 2018, while ethanol as a percentage of the fuel supply remained steady. A decrease in demand for either gasoline or ethanol blends would adversely impact the price of ethanol, which could result in a material adverse effect on our business, results of operations and financial condition. The price of distillers’ grains is affected by the price of other commodity products, such as soybeans, and decreases in the price of these commodities could decrease the price of distillers’ grains. the price of distillers’ grains. The price of distillers’ grains is not tied to production costs. However, decreases in the price of distillers’ grains would result in less revenue from the sale of distillers’ grains and could result in lower profit margins. Historically, sales prices for distillers’ grains have been correlated with prices of corn. However, there have been occasions when the price increase for this co-product has lagged behind increases in corn prices. In addition, our distillers’ grains co-product competes with products made from other feedstocks, the cost of which may not have risen as corn prices have risen. Consequently, the price we may receive for distillers’ grains may not rise as corn prices rise, thereby lowering our cost recovery percentage relative to corn. The prices of ethanol and distillers’ grains may decline as a result of trade barriers imposed by foreign countries with respect to ethanol and distillers’ grains originating in the U.S. and negatively affect our profitability. An increasing amount of our industry’s products are being exported. The U.S. ethanol industry was supported during our 2018 fiscal year with exports of ethanol which increased demand for our ethanol. Management believes these additional exports of ethanol were due to lower market ethanol prices in the U.S. and increased global demand for ethanol. However, these ethanol exports may not continue. If producers and exporters of ethanol and distillers’ grains are subjected to trade barriers when selling products to foreign customers, such as the tariffs currently in effect, there may be a reduction in the price of these products in the U.S. Declines in the price we receive for our products will lead to decreased revenues and may result in our inability to operate the ethanol plant profitably. If U.S. producers cannot satisfy import requirements imposed by countries importing distillers’ grains, export demand could be significantly reduced as a result. If export demand of distillers’ grains is significantly reduced as a result, the price of distillers’ grains in the U.S. would likely continue to decline which would have a negative effect on our revenue and could impact our ability to profitably operate which could in turn reduce the value of our units. We face intense competition that may result in reductions in the price we receive for our ethanol, increases in the prices we pay for our corn, or lower gross profits. Competition in the ethanol industry is intense. We face formidable competition in every aspect of our business from both larger and smaller producers of ethanol and distillers’ grains. Some larger producers of ethanol, such as Archer Daniels Midland Company, POET Biorefining, Cargill, Inc., and Valero Energy Corporation, have substantially greater financial, operational, procurement, marketing, distribution and technical resources than we have. We may not be able to compete with these larger entities. These larger ethanol producers may be able to affect the ethanol market in ways that are not beneficial to us which could affect our financial performance. Additionally, smaller competitors, such as farmer-owned cooperatives and independent companies owned by farmers and investors, have business advantages, such as the ability to more favorably procure corn by operating smaller plants that may not affect the local price of corn as much as a larger-scale plant like ours or requiring their farmer-owners to sell them corn as a requirement of ownership. Because Minnesota is one of the top producers of ethanol in the U.S., we face increased competition because of the location of our ethanol plants. Competing ethanol producers may introduce competitive pricing pressures that may adversely affect our sales levels and margins or our ability to procure corn at favorable prices. As a result, we cannot assure you that we will be able to compete successfully with existing or new competitors. Until recently, oil companies, petrochemical refiners and gasoline retailers have not been engaged in ethanol production to a large extent. These companies, however, form the primary distribution networks for marketing ethanol through blended gasoline. During the past few years, several large oil companies have begun to penetrate the ethanol production market. If these companies increase their ethanol plant ownership or other oil companies seek to engage in direct ethanol production, such as Valero Renewable Fuels and Flint Hills Resources which are subsidiaries of larger oil companies, there may be a decrease in the demand for ethanol from smaller independent ethanol producers like us which could result in an adverse effect on our operations, cash flows and financial condition. We also face increasing competition from international ethanol suppliers. Most international ethanol producers have cost structures that can be substantially lower than ours and therefore can sell their ethanol for substantially less than we can. Competing ethanol producers may introduce competitive pricing pressures that may adversely affect our sales levels and margins or our ability to procure corn at favorable prices. As a result, we cannot assure you that we will be able to compete successfully with existing or new competitors. We engage in hedging transactions which involve risks that could harm our business. We are exposed to market risk from changes in commodity prices. Exposure to commodity price risk results from our dependence on corn and natural gas in the ethanol production process. We seek to minimize the risks from fluctuations in the prices of corn, natural gas and ethanol through the use of hedging instruments. The effectiveness of our hedging strategies is dependent on the price of corn, natural gas and ethanol and our ability to sell sufficient products to use all of the corn and natural gas for which we have futures contracts. Our hedging activities may not successfully reduce the risk caused by price fluctuation which may leave us vulnerable to high corn and natural gas prices, as well as low ethanol prices. Operational difficulties at our plants could negatively impact our sales volumes and could cause us to incur substantial losses. We have experienced operational difficulties at our plants in the past that have resulted in scheduled and unscheduled downtime or reductions in the number of gallons of ethanol we produce. Some of the difficulties we have experienced relate to production problems, repairs required to our plants’ equipment and equipment maintenance, the installation of new equipment and related testing, and our efforts to improve and test our air emissions. Our revenues are driven in large part by the number of gallons of ethanol and the number of tons of distillers’ grains we produce. If our ethanol plants do not efficiently produce our products in high volumes, our business, results of operations, and financial condition may be materially adversely affected. Our operations are also subject to operational hazards inherent in our industry and to manufacturing in general, such as equipment failures, fires, explosions, abnormal pressures, blowouts, pipeline ruptures, transportation accidents and natural disasters. Some of these operational hazards may cause personal injury or loss of life, severe damage to or destruction of property and equipment or environmental damage, and may result in suspension of operations and the imposition of civil or criminal penalties. The occurrence of any of these operational hazards may materially adversely affect our business, results of operations and financial condition. Further, our insurance may not be adequate to fully cover the potential operational hazards described above or we may not be able to renew this insurance on commercially reasonable terms or at all. Our operations and financial performance could be adversely affected by infrastructure disruptions and lack of adequate transportation and storage infrastructure in certain areas. We ship our ethanol to our customers primarily by the railroad adjacent to our plant sites. We also have the potential to receive inbound corn via the railroad. Our customers require appropriate transportation and storage capacity to take delivery of the products we produce. Without the appropriate flow of natural gas to our plants, we may not be able to run at desired production levels or at all. Therefore, our business is dependent on the continuing availability of rail, highway and related infrastructure. Any disruptions in this infrastructure network, whether caused by labor difficulties, earthquakes, storms, other natural disasters, human error or malfeasance or other reasons, could have a material adverse effect on our business. We rely upon third-parties to maintain the rail lines from our plants to the national rail network, and any failure on their part to maintain the lines could impede our delivery of products, impose additional costs on us and could have a material adverse effect on our business, results of operations and financial condition. growth in service stations equipped to handle ethanol fuels. The substantial investments that will be required for these infrastructure changes and expansions may not be made on a timely basis, if at all, and decisions regarding these infrastructure improvements are outside of our control. Significant delay or failure to improve the infrastructure that facilitates the distribution could curtail more widespread ethanol demand or reduce prices for our products in certain areas, which would have a material adverse effect on our business, results of operations or financial condition. Rail logistical problems may result in delays in shipments of our products which could negatively impact our financial performance. There has been an increase in rail traffic congestion throughout the U.S. primarily due to the increase in cargo trains carrying shale oil. From time to time, periodic high demand and unusually adverse weather conditions may cause rail congestion resulting in rail delays and rail logistical problems. Although we have not been materially affected by prior rail congestion period, future periods of congestion may affect our ability to operate our plants at full capacity due to ethanol storage capacity constraints, which in turn could have a negative effect on our financial performance. We depend on our management and key employees, and the loss of these relationships could negatively impact our ability to operate profitably. Our success depends in part on our ability to attract and retain competent personnel. For our ethanol plants, we must hire qualified managers, operations personnel, accounting staff and others, which can be challenging in a rural community. Further, our current employees may decide to end their employment with us. Competition for employees in the ethanol industry is intense, and we may not be able to attract and retain qualified personnel. We are highly dependent on our management team to operate our ethanol plants. We may not be able to replace these individuals should they decide to cease their employment with us, or if they become unavailable for any other reason. Any loss of these officers and key employees may prevent us from operating the ethanol plants profitably and could decrease the value of our units. Technology in our industry evolves rapidly, potentially causing our plants to become obsolete, and we must continue to enhance the technology of our plants or our business may suffer. We expect that technological advances in the processes and procedures for processing ethanol will continue to occur. It is possible that those advances could make the processes and procedures that we utilize at our ethanol plants less efficient or obsolete. These advances could also allow our competitors to produce ethanol at a lower cost than we are able. If we are unable to adopt or incorporate technological advances, our ethanol production methods and processes could be less efficient than those of our competitors, which could cause our ethanol plants to become uncompetitive. Competition from the advancement of alternative fuels may lessen the demand for ethanol. Alternative fuels, gasoline oxygenates and ethanol production methods are continually under development. A number of automotive, industrial and power generation manufacturers are developing alternative clean power systems using fuel cells, plug-in hybrids or clean burning gaseous fuels. Like ethanol, these emerging technologies offer an option to address worldwide energy costs, the long-term availability of petroleum reserves and environmental concerns. If these alternative technologies continue to expand and gain broad acceptance and become readily available to consumers for motor vehicle use, we may not be able to compete effectively. This additional competition could reduce the demand for ethanol, resulting in lower ethanol prices that might adversely affect our results of operations and financial condition. Our sales will decline, and our business will be materially harmed if our third party marketers do not effectively market or sell the ethanol, distillers’ grains and corn oil we produce or if there is a significant reduction or delay in orders from our marketers. We have entered into agreements with a third parties to market our supply of ethanol, distillers’ grains and corn oil. Our marketers are independent businesses that we do not control. We cannot be certain that our marketers will market or sell our ethanol, distillers’ grains and corn oil effectively. Our agreements with our marketers do not contain requirements that a certain percentage of sales are of our products, nor do the agreements restrict the marketer’s ability to choose alternative sources for ethanol, distillers’ grains or corn oil. Our success in achieving revenue from the sale of ethanol, distillers’ grains and corn oil will depend upon the continued viability and financial stability of our marketers. Our marketers may choose to devote their efforts to other producers or reduce or fail to devote the necessary resources to provide effective sales and marketing support of our products. We believe that our financial success will continue to depend in large part upon the success of our marketers in operating their businesses. If our marketers breach their contracts or do not have the ability, for financial or other reasons, to market all of the ethanol we produce or to market the co-products produced at our plants, we may not have any readily available alternative means to sell our products. Our lack of a sales force and reliance on these third parties to sell and market most of our products may place us at a competitive disadvantage. Our failure to sell all of our ethanol and co-products may result in lower revenues and reduced profitability. We are exposed to credit risk resulting from non-payment by significant customers. We have a concentration of credit risk because GFE sells all of the ethanol, distillers’ grains, and corn oil produced to two customers and HLBE sells all of its ethanol, distillers’ grains, and corn oil produced to three customers. Although we typically receive payments timely and within the terms of our marketing agreements with these customers, we continually monitor this credit risk exposure. These customers accounted for approximately 100.0% of GFE’s revenue for the years ended October 31, 2018, 2017, and 2016, and approximately 98.0% and 98.3% of GFE’s outstanding accounts receivable balance at October 31, 2018 and 2017, respectively. At HLBE, these customers accounted for approximately 98.3%, 99.5%, and 98.3% of HLBE’s revenue for the years ended October 31, 2018, 2017, and 2016, respectively, and approximately 95.6% and 98.1% of HLBE’s outstanding accounts receivable balance at October 31, 2018 and 2017, respectively. The inability of a third party to pay our accounts receivable may cause us to experience losses and may adversely affect our liquidity and our ability to make our payments when due. Consumer resistance to the use of ethanol based on the belief that ethanol is expensive, adds to air pollution, harms engines and/or takes more energy to produce than it contributes may affect the demand for ethanol. Certain individuals believe that the use of ethanol will have a negative impact on gasoline prices at the pump. Some also believe that ethanol adds to air pollution and harms car and truck engines. Still other consumers believe that the process of producing ethanol actually uses more fossil energy, such as oil and natural gas, than the amount of energy that is produced. These consumer beliefs could potentially be wide-spread and may be increasing as a result of recent efforts to increase the allowable percentage of ethanol that may be blended for use in conventional automobiles. If consumers choose not to buy ethanol based on these beliefs, it would affect the demand for the ethanol we produce which could negatively affect our profitability and financial condition. Our failure to comply with existing or future regulatory requirements could have a material adverse effect on our business, financial condition and results of operations. We are subject to various federal, state and local environmental laws and regulations, including those relating to the discharge of materials into the air, water and ground. Certain aspects of our operations require environmental permits and controls to prevent and reduce air and water pollution, and these permits are subject to modification, renewal and revocation by issuing authorities including the Minnesota Pollution Control Agency. We could incur substantial costs, including cleanup costs, fines and civil or criminal sanctions and third-party claims for property damage and personal injury as a result of violations of or liabilities under environmental laws or non-compliance with environmental permits. We could also incur substantial costs and experience increased operating expenses as a result of operational changes to comply with environmental laws, regulations and permits. We have previously incurred substantial costs relating to our air emissions permit and expect additional costs relating to this permit in the future. Our plants’ air permits require certain on-going performance testing to be completed periodically to ensure compliance with minor source emission limits. On May 12, 2017, HLBE submitted a letter to the MPCA regarding the results of certain non-compliant tests. On October 17, 2017, HLBE entered into a stipulation agreement with the MPCA relating to these non-compliant tests. Under the stipulation agreement, HLBE agreed to pay a civil penalty of $63,500, which was paid in October 2017. Further, environmental laws and regulations are subject to substantial change. We cannot predict what material impact, if any, these changes in laws or regulations might have on our business. Future changes in regulations or enforcement policies could impose more stringent requirements on us, compliance with which could require additional capital expenditures, increase our operating costs or otherwise adversely affect our business. These changes may also relax requirements that could prove beneficial to our competitors and thus adversely affect our business. In addition, regulations of the EPA and the MPCA depend heavily on administrative interpretations. We cannot assure you that future interpretations made by regulatory authorities, with possible retroactive effect, will not adversely affect our business, financial condition and results of operations. Failure to comply with existing or future regulatory requirements could have a material adverse effect on our business, financial condition and results of operations. Because federal and state regulation heavily influence the supply of and demand for ethanol, changes in government regulation that adversely affect demand or supply will have a material adverse effect on our business. Various federal and state laws, regulations and programs impact the supply of and demand for ethanol. We believe the most important of these is the RFS, which sets minimum national volume standards for use of cellulosic, biomass-based diesel and total advanced renewable fuels. The RFS helps support a market for ethanol that might disappear without this incentive. In the case of the RFS, while it creates a demand for ethanol, the existence of specific categories of renewable fuels also creates a demand for these types of renewable fuels and will likely provide an incentive for companies to further develop these products to capitalize on that demand. In these circumstances, the RFS may also reduce demand for ethanol in favor of the renewable fuels for which specific categories exist. By statute, the RFS requires that 16.55 billion gallons be sold or dispensed in 2013, increasing to 36.0 billion gallons by 2022, but caps the amount of corn-based ethanol that can be used to meet the renewable fuels blending requirements at 15.0 billion gallons for 2015 and thereafter. On November 30, 2018, the EPA announced final RVO requirements for the RFS for calendar year 2019. The corn-based biofuel requirement of 15.0 billion gallons equating to the statutory requirement level as originally set by Congress when the RFS was enacted. However, the overall RVOs were set at 19.92 billion gallons for 2019, more than 20% below the overall statutory level of 26 billion gallons, due to decreases in the RVOs for cellulosic ethanol and advanced biofuels. The 2018 standard was also more than 20% below the overall statutory level. According to the RFS, if mandatory renewable fuel volumes are reduced by at least 20% for two consecutive years, the EPA is required to modify, or reset, statutory volumes through 2022. In October 2018, the Office of Management and Budget announced that the 20% thresholds “have been met or are expected to be met in the near future.” As a result, the EPA is proposing a rulemaking that will propose modifying the applicable volumes targets for cellulosic biofuel, advanced biofuel, and total renewable fuels for the years 2020-2022. Additionally, the EPA will be proposing volume requirements for biomass-based diesel for 2021 and 2022. Because the timetable for the rulemaking overlaps with the annual standard-setting rulemakings, the rulemaking will also include the applicable percentage standards for 2020. If the statutory RVOs are reduced as a result of reset, it could have an adverse effect on the market price and demand for ethanol which would negatively impact our financial performance. Current ethanol production capacity exceeds the 2018 RVO standard which can be satisfied by corn-based ethanol. Reduction of blending requirements could reduce the demand for and price of ethanol. If demand for ethanol decreases, it could materially adversely affect our business, results of operations and financial condition. Additionally, opponents of ethanol such as large oil companies will likely continue their efforts to repeal or reduce the RFS through lawsuits or lobbying of Congress. Successful reduction or repeal of the blending requirements of the RFS could have an adverse effect on the market price and demand for ethanol which would negatively impact our financial performance. The EPA imposed E10 “blend wall” if not overcome will have an adverse effect on demand for ethanol. reconcile the conflicting requirements. In 2011, the EPA allowed the use of E15, gasoline which is blended at a rate of 15% ethanol and 85% gasoline, in vehicles manufactured in the model year 2001 and later. Management believes that many gasoline retailers will refuse to provide E15 due to the fact that not all standard vehicles will be allowed to use E15 and due to the labeling requirements the EPA may impose. As a result, the approval of E15 may not significantly increase demand for ethanol. In addition, different gasoline blendstocks may be required at certain times of the year in order to use E15 due to current federal regulations related to fuel evaporative emissions. This may prevent E15 from being used during certain times of the year in various states. However, in October 2018, President Trump directed the EPA to promulgate a regulation making E15 available year-round. The Office of Management and Budget expects that the EPA will release a proposed rule in February 2019, with the final rule scheduled to be issued in May 2019. Notably, much of the EPA’s staff was subject to furlough due to a partial government shutdown during January 2019. It is also important to note that the oil industry is expected to challenge this rulemaking. As a result, there is no guarantee that the year-round E15 rule will be finalized pursuant to the proposed timeline, nor is there a guarantee that the rule will ever be finalized. The California Low Carbon Fuel Standard may decrease demand for corn based ethanol which could negatively impact our profitability. California passed a Low Carbon Fuels Standard (“LCFS”) which requires that renewable fuels used in California must accomplish certain reductions in greenhouse gases which reductions are measured using a lifecycle analysis. Management believes that these regulations could preclude corn based ethanol produced in the Midwest from being used in California. California represents a significant ethanol demand market. If the ethanol industry is unable to supply corn based ethanol to California, it could significantly reduce demand for the ethanol we produce. This could result in a reduction of our revenues and negatively impact our ability to profitably operate the ethanol plant. Meeting the requirements of evolving environmental, health and safety laws and regulations, and in particular those related to climate change, could adversely affect our financial performance. When the EPA released its final regulations on RFS, these regulations grandfathered our plants at their current production capacity for the generation of RINs for compliance with RFS. Any expansion of our plants beyond the grandfathered volumes must meet a threshold of a 20% reduction in GHG emissions from a 2005 baseline measurement for the ethanol to be eligible to generate RINS for compliance with the RFS mandate. In 2015, our plants were awarded “efficient producer” status under the pathway petition program for the non-grandfathered volumes of ethanol produced at our plants. Pursuant to the award approval, HLBE and GFE are only authorized to generate RINs for each plant’s non-grandfathered volumes if each plant can demonstrate that all ethanol produced at the plant during an averaging period (defined as the prior 365 days or the number of days since the date EPA efficient producer pathway approval) meets the 20% GHG reduction requirement. Although we believe GFE and HLBE will be able to maintain continuous compliance with the 20% reduction in GHG emissions requirement as presently operated, there is no guarantee that we will not have to install carbon dioxide mitigation equipment or take other steps unknown to us at this time in order to comply with the efficient producer requirements or other future law or regulation. Continued compliance with the efficient producer GHG reduction requirements or compliance with future law or regulation of carbon dioxide, could be costly and may prevent us from operating our plants as profitably, which may have an adverse impact on our operations, cash flows and financial position. If we fail to comply with the 20% reduction in GHG emissions requirement, we will not be able to generate RINs for our non-grandfathered volumes of ethanol, which could adversely affect our operating margins. ethanol in the export market where RINs are not required, which could adversely affect our results of operations, cash flows and financial condition. Failures of our information technology infrastructure could have a material adverse effect on operations. We utilize various software applications and other information technology that are critically important to our business operations. We rely on information technology networks and systems, including the Internet, to process, transmit and store electronic and financial information, to manage a variety of business processes and activities, including production, manufacturing, financial, logistics, sales, marketing and administrative functions. We depend on our information technology infrastructure to communicate internally and externally with employees, customers, suppliers and others. We also use information technology networks and systems to comply with regulatory, legal and tax requirements. These information technology systems, some of which are managed by third parties, may be susceptible to damage, disruptions or shutdowns due to failures during the process of upgrading or replacing software, databases or components thereof, power outages, hardware failures, computer viruses, attacks by computer hackers or other cybersecurity risks, telecommunication failures, user errors, natural disasters, terrorist attacks or other catastrophic events. If any of our significant information technology systems suffer severe damage, disruption or shutdown, and our disaster recovery and business continuity plans do not effectively resolve the issues in a timely manner, our product sales, financial condition and results of operations may be materially and adversely affected. A cyber attack or other information security breach could have a material adverse effect on our operations and result in financial losses. We are regularly the target of attempted cyber and other security threats and must continuously monitor and develop our information technology networks and infrastructure to prevent, detect, address and mitigate the risk of unauthorized access, misuse, computer viruses and other events that could have a security impact. If we are unable to prevent cyber attacks and other information security breaches, we may encounter significant disruptions in our operations which could adversely impact our business, financial condition and results of operations or result in the unauthorized disclosure of confidential information. Such breaches may also harm our reputation, result in financial losses or subject us to litigation or other costs or penalties. There is no public market for our units and no public market is expected to develop. There is no established public trading market for our units, and we do not expect one to develop in the foreseeable future. We have established through FNC Ag Stock, LLC, a Unit Trading Bulletin Board, a private online matching service, in order to facilitate trading among our members. The Unit Trading Bulletin Board has been designed to comply with federal tax laws and IRS regulations establishing a “qualified matching service,” as well as state and federal securities laws. The Unit Trading Bulletin Board does not automatically affect matches between potential sellers and buyers and it is the sole responsibility of sellers and buyers to contact each other to make a determination as to whether an agreement to transfer units may be reached. There are detailed timelines that must be followed under the Unit Trading Bulletin Board Rules and Procedures with respect to offers and sales of membership units. All transactions must comply with the Unit Trading Bulletin Board Rules, our member control agreement, and are subject to approval by our board of governors. As a result, units held by our members may not be easily resold and members may be required to hold their units indefinitely. Even if members are able to resell our units, the price may be less than the members’ investment in the units or may otherwise be unattractive to the member. There are significant restrictions on the transfer of our units. agreement, members may not be able to transfer their units and may be required to assume the risks of the investment for an indefinite period of time. There is no assurance that we will be able to make distributions to our unit holders, which means that holders could receive little or no return on their investment. Distributions of our net cash flow may be made at the sole discretion of our board of governors, subject to the provisions of the Minnesota Limited Liability Company Act, our member control agreement and restrictions imposed by lender under our credit facilities. Our credit facilities currently limit our ability to make distributions to our members. If our financial performance and loan covenants permit, we expect to make cash distributions at times and in amounts that will permit our members to make income tax payments, along with distributions in excess of these amounts. However, our board may elect to retain cash for operating purposes, debt retirement, plant improvements or expansion. Although we have made distributions in the past, there is no guarantee that we will be in a financial position to pay distributions in the future, that the terms of our credit facility will allow us to make distributions to our members, or that distributions, if any, will be at times or in amounts to permit our members to make income tax payments. Consequently, members may receive little or no return on their investment in the units. EACH UNIT HOLDER SHOULD CONSULT THE INVESTOR’S OWN TAX ADVISOR WITH RESPECT TO THE FEDERAL AND STATE TAX CONSEQUENCES OF AN INVESTMENT IN GRANITE FALLS ENERGY, LLC AND ITS IMPACT ON THE INVESTOR’S TAX REPORTING OBLIGATIONS AND LIABILITY. If we are not taxed as a partnership, we will pay taxes on all of our net income and you will be taxed on any earnings we distribute, and this will reduce the amount of cash available for distributions to holders of our units. We consider Granite Falls Energy, LLC to be a partnership for federal income tax purposes. This means that we will not pay any federal income tax, and our members will pay tax on their share of our net income. If we are unable to maintain our partnership tax treatment or qualify for partnership taxation for whatever reason, then we may be taxed as a corporation. We cannot assure you that we will be able to maintain our partnership tax classification. For example, there might be changes in the law or our company that would cause us to be reclassified as a corporation. As a corporation, we would be taxed on our taxable income at rates of up to 35% for federal income tax purposes (21% beginning after December 31, 2017). Further, distributions would be treated as ordinary dividend income to our unit holders to the extent of our earnings and profits. These distributions would not be deductible by us, thus resulting in double taxation of our earnings and profits. This would also reduce the amount of cash we may have available for distributions. Your tax liability from your allocated share of our taxable income may exceed any cash distributions you receive, which means that you may have to satisfy this tax liability with your personal funds. As a partnership for federal income tax purposes, all of our profits and losses “pass-through” to our unit holders. You must pay tax on your allocated share of our taxable income every year. You may incur tax liabilities from allocations of taxable income for a particular year or in the aggregate that exceed any cash distributions you receive in that year or in the aggregate. This may occur because of various factors, including but not limited to, accounting methodology, the specific tax rates you face, and payment obligations and other debt covenants that restrict our ability to pay cash distributions. If this occurs, you may have to pay income tax on your allocated share of our taxable income with your own personal funds. You may not be able to fully deduct your share of our losses or your interest expense. disposition of a taxpayer’s entire interest in a passive activity to an unrelated person in a taxable transaction, suspended losses with respect to that activity may then be deducted. Interest paid on any borrowings incurred to purchase units may not be deductible in whole or in part because the interest must be aggregated with other items of income and loss that the unit holder has independently experienced from passive activities and subjected to limitations on passive activity losses. Deductibility of capital losses that we incur and pass through to you or that you incur upon disposition of units may be limited. Capital losses are deductible only to the extent of capital gains plus, in the case of non-corporate taxpayers, the excess may be used to offset a portion of ordinary income. If a non-corporate taxpayer cannot fully utilize a capital loss because of this limitation, the unused loss may be carried forward and used in future years subject to the same limitations in the future years. Although we expect that a number of our members may qualify for the Qualified Business Income Deduction (“QBID”), you may not qualify for the QBID. Your ownership of our units may qualify you for the QBID. Pursuant to the Tax Cuts and Jobs Act of 2017, the QBID allows for a deduction of up to 20% of the qualified business income (“QBI”) of an owner of a pass-through entity. QBI generally includes the net amount of qualified income, gain, deduction, and loss from a domestic trade or business in which the taxpayer is an owner. The calculation of the QBID depends on a variety of factors, with the most significant factor being the taxpayer’s taxable income. For married persons filing jointly with taxable income equal to or less than the threshold amount, which is subject to adjustment for inflation, of $315,000 ($157,500 for taxpayers filing single), a taxpayer’s QBID is the lesser of: (1) 20% of the taxpayer’s QBI, or (2) 20% of the taxpayer’s taxable income less their net capital gains. For married persons filing jointly with taxable income exceeding the above-referenced threshold amounts, the QBID is subject to further limitations, such as limitations based on the amount of W-2 wages paid with respect to that entity or business, the unadjusted basis of qualified property in the business, and the type of trade or business. Because the impact of this deduction is dependent upon your particular tax situation, you should consult your own tax advisor on your eligibility for the QBID. There is no guarantee that you will qualify for the QBID. Preparation of your tax returns may be complicated and expensive. The tax treatment of limited liability companies and the rules regarding partnership allocations are complex. We will file a partnership income tax return and will furnish each unit holder with a Schedule K-1 that sets forth our determination of that unit holder’s allocable share of income, gains, losses and deductions. In addition to U.S. federal income taxes, unit holders will likely be subject to other taxes, such as state and local taxes, that are imposed by various jurisdictions. It is the responsibility of each unit holder to file all applicable federal, state and local tax returns and pay all applicable taxes. You may wish to engage a tax professional to assist you in preparing your tax returns and this could be costly to you. Any audit of our tax returns resulting in adjustments could result in additional tax liability to you. The IRS may audit our tax returns and may disagree with the positions that we take on our returns or any Schedule K-1. If any of the information on our partnership tax return or a Schedule K-1 is successfully challenged by the IRS, the character and amount of items of income, gains, losses, deductions or credits in a manner allocable to some or all our unit holders may change in a manner that adversely affects those unit holders. This could result in adjustments on unit holders’ tax returns and in additional tax liabilities, penalties and interest to you. An audit of our tax returns could lead to separate audits of your personal tax returns, especially if adjustments are required. headquarters. The site also includes corn, ethanol, and distillers’ grains handling facilities. All of our tangible and intangible property, real and personal, serves as the collateral for our credit facilities with United FCS, PCA. HLBE’s ethanol plant is sited on approximately 216 acres of land located near Heron Lake, Minnesota. The site includes corn, coal, ethanol, and distillers’ grains storage and handling facilities. Located on these 216 acres is an administration building that serves as HLBE’s headquarters. The plant’s address is 91246 390th Avenue, Heron Lake, Minnesota 56137-3175. All of HLBE’s real property is subject to mortgages in favor of its senior lender, Compeer Financial (formerly known as AgStar Financial Services, FCLA) as security for loan obligations. HLBE’s majority owned subsidiary, Agrinatural, property consists of 190 miles of distribution main pipelines and service pipelines, together with the associated easement and land rights, a town border station, meters and regulators, office and other equipment and construction in process. All of Agrinatural’s real property and assets are subject to mortgages in favor of HLBE as security for loan obligations owed to HLBE. HLBE’s and Agrinatural’s credit facilities are discussed in more detail under “ITEM 7. MANAGEMENT’S DISCUSSION AND ANALYSIS OF FINANCIAL CONDITION AND RESULTS OF OPERATIONS - Credit Arrangements”. From time to time in the ordinary course of business, Granite Falls Energy, LLC or its subsidiaries may be named as a defendant in legal proceedings related to various issues, including workers’ compensation claims, tort claims, or contractual disputes. We are not currently involved in any material legal proceedings. There is no public trading market for our units. However, GFE has established an online unit trading bulletin board (“QMS”) through FNC Ag Stock, LLC, in order to facilitate trading in our units. The QMS has been designed to comply with federal tax laws and IRS regulations establishing a “qualified matching service,” as well as state and federal securities laws. The QMS consists of an electronic bulletin board that provides a list of interested buyers with a list of interested sellers, along with their non-firm price quotes. The QMS does not automatically affect matches between potential sellers and buyers and it is the sole responsibility of sellers and buyers to contact each other to make a determination as to whether an agreement to transfer units may be reached. We do not become involved in any purchase or sale negotiations arising from the QMS and have no role in effecting the transactions beyond approval, as required under our member control agreement, and the issuance of new certificates. We do not give advice regarding the merits or shortcomings of any particular transaction. We do not receive, transfer or hold funds or securities as an incident of operating the QMS. We do not receive any compensation for creating or maintaining the QMS. In advertising the QMS, we do not characterize Granite Falls Energy as being a broker or dealer or an exchange. We do not use the QMS to offer to buy or sell securities other than in compliance with securities laws, including any applicable registration requirements. There are detailed timelines that must be followed under the QMS rules and procedures with respect to offers and sales of membership units. All transactions must comply with the QMS rules and procedures, our member control agreement, and are subject to approval by our board of governors. continuing to make information about the Company publicly available on our website in order to continue operating the QMS. The following table contains historical information by fiscal quarter for the past two fiscal years regarding the actual unit transactions that were completed by our unit-holders during the periods specified. We believe this most accurately represents the current trading value of the Company’s units. The information was compiled by reviewing the completed unit transfers that occurred on our qualified matching service bulletin board during the quarters indicated. As a limited liability company, we are required to restrict the transfers of our membership units in order to preserve our partnership tax status. Our membership units may not be traded on any established securities market or readily traded on a secondary market (or the substantial equivalent thereof). All transfers are subject to a determination that the transfer will not cause Granite Falls Energy to be deemed a publicly traded partnership. We did not make any repurchases of our units during fiscal year 2018. As of January 29, 2019, there were approximately 987 holders of record of our membership units. As of October 31, 2018 and January 29, 2019, there were no outstanding options or warrants to purchase, or securities convertible for or into, our units. Distributions by GFE to its unit holders are in proportion to the number of units held by each unit holder. A unit holder’s distribution is determined by multiplying the number of units by distribution per unit declared. GFE’s board of governors has complete discretion over the timing and amount of distributions to our unit holders. However, GFE’s credit facility with United FCS, PCA provides that we may not declare any distributions other than, for each fiscal year, one or more distributions up to an aggregate of 100% of the net profit (determined according to GAAP) for such fiscal year; provided that we are and will remain in compliance with all of the covenants, terms and conditions of the credit facility. If our financial performance and loan covenants permit, we expect to make future cash distributions at times and in amounts that will permit our members to make income tax payments, along with distributions in excess of these amounts. Cash distributions are not assured, however, and in the future, we may not be in a position to make distributions. Under Minnesota law, we cannot make a distribution to a member if, after the distribution, we would not be able to pay our debts as they become due or our liabilities, excluding liabilities to our members on account of their capital contributions, would exceed our assets. Below is a table representing the cash distributions declared or paid to the members of Granite Falls Energy during the fiscal years ended October 31, 2018, 2017, and 2016, and subsequent to our fiscal year ended October 31, 2018. Based on the covenants discussed above, all of the below distributions were approved by our lender prior to distribution. Distributions by HLBE to its unit holders are in proportion to the number of units held by each unit holder. A unit holder's distribution is determined by multiplying the number of units by distribution per unit declared. HLBE’s board of governors has complete discretion over the timing and amount of distributions to its unit holders. Distributions are restricted by certain loan covenants in its credit facility with Compeer. Additionally, under Minnesota law, HLBE cannot make a distribution to a member if, after the distribution, it would not be able to pay its debts as they become due or its liabilities, excluding liabilities to its members on account of their capital contributions, would exceed its assets. Below is a table representing the cash distributions declared or paid to HLBE’s members, as well as GFE’s share of the same, during the fiscal years ended October 31, 2018, 2017, and 2016. Based on the covenants discussed above, all of the below distributions were approved by HLBE’s lender prior to distribution. No additional distributions were either declared or paid in 2018. (1)At the record date, GFE owned 24,475,824 Class A membership units and 15,000,000 Class B units of HLBE, or approximately 50.7% of the outstanding membership units of HLBE. (2)At the record date, GFE owned 24,420,949 Class A membership units and 15,000,000 Class B units of HLBE, or approximately 50.6% of the outstanding membership units of HLBE. The Company had no unregistered sales of securities during fiscal year 2018. As of the date of this annual report, we had no “equity compensation plans” (including individual equity compensation arrangements) under which any of our equity securities are authorized for issuance. 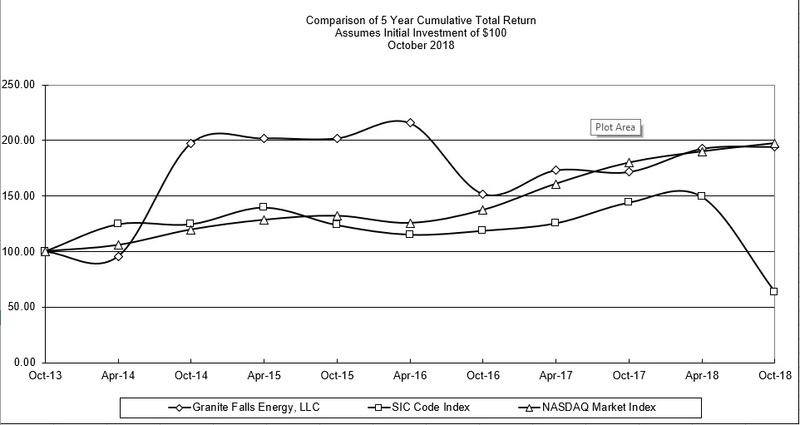 The following graph shows a comparison of cumulative total member return since October 31, 2013, calculated on a dividend reinvested basis, for the Company, the NASDAQ Composite Index (the “NASDAQ”) and an index of other companies that have the same SIC code as the Company (the “SIC Code Index”). The graph assumes $100 was invested in each of the Company’s units, the NASDAQ, and the Industry Index on October 31, 2013. Data points on the graph are annual. Note that historic stock price performance is not necessarily indicative of future unit price performance. The following table presents selected consolidated financial and operating data as of the dates and for the periods indicated. The following information includes consolidated financial and operating data for the fiscal years 2018, 2017, 2016, 2015, and 2014. The selected consolidated balance sheet financial data as of October 31, 2018 and 2017 and the selected consolidated statement of operations data and other financial data for each of the years in the three-year period ended October 31, 2018 have been derived from the audited consolidated financial statements included elsewhere in this Form 10-K. The selected consolidated balance sheet financial data as of October 31, 2016, 2015 and 2014 and the selected consolidated statement of operations data and other financial data for the years ended October 31, 2015 and 2014 have been derived from our audited consolidated financial statements that are not included in this Form 10-K. The consolidated financial statements consolidate the operating results and financial position of GFE and its wholly owned subsidiary, Project Viking, which owns 50.7% of HLBE at October 31, 2018. The remaining approximately 49.3% ownership of HLBE is included in the consolidated financial statements as a non-controlling interest. This selected consolidated financial data should be read in conjunction with “ITEM 7 - MANAGEMENT’S DISCUSSION AND ANALYSIS OF FINANCIAL CONDITION AND RESULTS OF OPERATIONS” and the consolidated financial statements and the accompanying notes included elsewhere in this Annual Report on Form 10-K. Among other things, those financial statements include more detailed information regarding the basis of presentation for the following consolidated financial data (amounts in thousands, except per unit data and unless context otherwise requires). ITEM 7.MANAGEMENT’S DISCUSSION AND ANALYSIS OF FINANCIAL CONDITION AND RESULTS OF OPERATIONS. We prepared the following discussion and analysis to help readers better understand our financial condition, changes in our financial condition, and results of operations for the fiscal year ended October 31, 2018. This discussion should be read in conjunction with the consolidated financial statements included herewith and notes to the consolidated financial statements thereto and the risk factors contained herein. Our business consists primarily of the production and sale of ethanol and its co-products (wet, modified wet and dried distillers’ grains, corn oil and corn syrup) locally, and throughout the continental U.S. Our production operations are carried out at GFE’s plant located in Granite Falls, Minnesota and HLBE’s ethanol plant near Heron Lake, Minnesota. The GFE plant has an annual production capacity of approximately 63 million gallons of denatured ethanol, but is currently permitted to produce up to 70 million gallons of undenatured ethanol on a twelve month rolling sum basis. The HLBE plant has an approximate annual production capacity of 65 million gallons of denatured ethanol, but is currently permitted production capacity to produce approximately 72 million gallons of undenatured ethanol on a twelve-month rolling sum basis. We intend to continue working toward increasing production to take advantage of the additional production allowed pursuant to our permits as long as we believe it is profitable to do so. HLBE also owns a controlling 73.0% interest in Agrinatural, which is a natural gas distribution and sales company located in Heron Lake, Minnesota that owns approximately 190 miles of natural gas pipeline and provides natural gas to HLBE’s ethanol plant and other commercial, agricultural and residential customers through a connection with the natural gas pipeline facilities of Northern Border Pipeline Company. Agrinatural's revenues are generated through natural gas distribution fees and sales. Our revenues from operations come from three primary sources: sales of fuel ethanol, sales of distillers' grains and sales of corn oil at GFE's ethanol plant and HLBE's ethanol plant. Operating segments are defined as components of an enterprise for which separate financial information is available that is evaluated regularly by the chief operating decision maker in deciding how to allocate resources and in assessing performance. Therefore, based on the criteria set forth in ASC 280 we have determined that based on the nature of the products and production process and the expected financial results, the Company’s operations at its ethanol plant and HLBE's plant, including the production and sale of ethanol and its co-products, are aggregated into one reporting segment. Additionally, we also realize relatively immaterial revenue from natural gas pipeline operations at Agrinatural, HLBE's majority owned subsidiary. The intercompany transactions between HLBE and Agrinatural resulting from the firm natural gas transportation agreement between the two companies are eliminated in consolidation. After intercompany eliminations, revenues from Agrinatural represent less than less than 1% of our consolidated revenues and have little to no impact on the overall performance of the Company. Therefore, our management does not separately review Agrinatural's operating performance information. Rather, management reviews Agrinatural's natural gas pipeline financial data on a consolidated basis with our ethanol production operations segment. Additionally, management believes that the presentation of separate operating performance information for Agrinatural's natural gas pipeline operations would not provide meaningful information to a reader of the Company’s audited consolidated financial statements. We currently do not have or anticipate that we will have any other lines of business or other significant sources of revenue other than the sale of ethanol and its co-products, which include distillers' grains and non-edible corn oil. Over the next year we will continue our focus on operational improvements at our plants. These operational improvements include exploring methods to improve ethanol yield per bushel and increasing production output at our plants, continued emphasis on safety and environmental regulation, reducing our operating costs, and optimizing our margin opportunities through prudent risk-management policies. We expect to have sufficient cash generated by continuing operations and availability on our credit facilities to fund our operations at our plants. However, should we experience unfavorable operating conditions in the ethanol industry that prevent us from profitably operating our plants, we may need to seek additional funding. In addition, we expect to continue to conduct routine maintenance and repair activities at the ethanol plants to maintain current plant infrastructure, as well as some small capital projects to improve operating efficiency. We anticipate using cash we generate from our operations and our credit facilities for each plant to finance these plant upgrade projects. The principal factors affecting our results of operations and financial conditions are the market prices for corn, ethanol, distillers’ grains and natural gas, as well as governmental programs designed to create incentives for the use of corn-based ethanol. Other factors that may affect our future results of operation include those risks and factors discussed in this report at “PART I - Item 1. Business” and “PART I - Item 1A. Risk Factors”. Our operations are highly dependent on commodity prices, especially prices for corn, ethanol, distillers’ grains and natural gas. As a result, our operating results can fluctuate substantially due to volatility in these commodity markets. The price and availability of corn is subject to significant fluctuations depending upon a number of factors that affect commodity prices in general, including crop conditions, yields, domestic and global stocks, weather, federal policy and foreign trade. Natural gas prices are influenced by severe weather in the summer and winter and hurricanes in the spring, summer and fall. Other factors include North American exploration and production, and the amount of natural gas in underground storage during injection and withdrawal seasons. Ethanol prices are sensitive to world crude oil supply and demand, domestic gasoline supply and demand, the price of crude oil, gasoline and corn, the price of substitute fuels and octane enhancers, refining capacity and utilization, government regulation and incentives and consumer demand for alternative fuels. Distillers’ grains prices are impacted by livestock numbers on feed, prices for feed alternatives and supply, which is associated with ethanol plant production. We expect our ethanol plants to produce approximately 2.8 gallons of denatured ethanol for each bushel of grain processed in the production cycle. Because the market price of ethanol is not always directly related to corn, at times ethanol prices may lag price movements in corn prices and corn-ethanol price spread (the difference between the price per gallon of ethanol and the price per bushel of grain divided by 2.8) may be tightly compressed or negative. If the corn-ethanol spread is compressed or negative for sustained period, it is possible that our operating margins will decline or become negative and our ethanol plants may not generate adequate cash flow for operations. In such cases, we may reduce or cease production at our ethanol plants in order to minimize our variable costs and optimize cash flow. For the fiscal year ended October 31, 2018 compared to fiscal year ended October 31, 2017, our average price per gallon of ethanol sold decreased 11.1%. There has been an increased domestic supply of ethanol, and gasoline demand has been flat. While export demand has slightly increased, the increased domestic supply of ethanol overshadows any increase in export demand. Additionally, the increase in approved economic hardship exemptions from the RVOs has recently effectively lowered the RVOs by a significant number of gallons of domestic demand. If this trend continues, it may continue to negatively impact the U.S. ethanol market. Management believes that the ethanol outlook moving into fiscal year 2019 will remain relatively flat and our margins will remain tight due to abundant corn supplies and relatively flat gasoline demand. Exports of ethanol have also been increasing; however, export demand for ethanol is less consistent compared to domestic demand which can lead to ethanol price volatility. During 2017 Brazil and China adopted import quotas and/or tariffs on the importation of ethanol which are expected to continue to negatively impact U.S. exports. China, the number three importer of U.S. ethanol in 2016, has imported negligible volumes since imposing a 30% tariff on U.S. and Brazil fuel ethanol on January 1, 2017 (which was subsequently increased to 45% in April 2018, and then again increased to 70% in July 2018). On September 1, 2017, Brazil’s Chamber of Foreign Trade imposed a 20% tariff on U.S. ethanol imports in excess of 150 million liters, or 39.6 million gallons per quarter. The tariff is valid for two years, which means that it is due to expire in September 2019. According to the RFA, during September 2017, Brazil fell out of the top two customers of U.S. ethanol exports for the first time in 16 months. However, U.S. exports to Brazil have remained steady from our 2017 fiscal year to our 2018 fiscal year. This tariff may still have a negative impact on the export market demand and prices for ethanol produced in the United States. Any decrease in U.S. ethanol exports could adversely impact the market price of ethanol unless domestic demand increases or foreign markets are developed. Corn prices trended upward during the first half of fiscal year 2018, becoming more volatile and trending down during the latter part of fiscal year 2018 as harvest was completed. The latest estimates of supply and demand provided by the U.S. Department of Agriculture (“USDA”) estimate the 2017-18 ending corn stocks at approximately 1.8 billion bushels, and project the 2018-19 corn supply at approximately 16.8 billion bushels with corn consumption for ethanol and co-products steady at approximately 5.6 billion bushels, suggesting lower corn prices into the first half of fiscal 2019. Weather, world supply and demand, current and anticipated stocks, agricultural policy and other factors can contribute to volatility in corn prices. If corn prices rise, it will have a negative effect on our operating margins unless the price of ethanol and distillers grains out paces rising corn prices. Distillers’ grains prices increased in 2018 over 2017, due to export demand and resource availability. Top export markets include Mexico, the European Union, Vietnam, Thailand, and South Korea. Of note, however, is that export demand from China, historically one of the largest importers of U.S. produced distillers grains, has significantly declined. In 2017, China imposed significant anti-dumping and anti-subsidies on distillers’ grains imported from the U.S. which saw significant declines in exports of U.S. distillers’ grains to China. Exports to China within the last year have grown markedly but are still substantially below the pre-tariff export levels. There is no guarantee that distillers’ grains exports to China will resume at pre-tariff levels. Management anticipates distillers’ grains prices will remain steady during our 2019 fiscal year, unless additional domestic demand or other foreign markets develop. Domestic demand for distillers’ grains could remain low if corn prices decline and end-users switch to lower priced alternatives. Corn oil prices have been adversely impacted by oversupply of corn oil due to the substantial increase in corn oil production during the last few years. Additionally, corn oil prices have been impacted by the oversupply of soybeans and the resulting lower price of soybean oil which competes with corn oil for biodiesel production. Given the inherent volatility in ethanol, distillers’ grains, non-food grade corn oil, grain and natural gas prices, we cannot predict the likelihood that the spread between ethanol, distillers’ grains, non-food grade corn oil and grain prices in future periods will be consistent compared to historical periods. Our revenues from operations come from three primary sources: sales of fuel ethanol, sales of distillers’ grains and sales of corn oil. Our remaining consolidated revenues are attributable to miscellaneous other revenue from incidental sales of corn syrup at HLBE’s plant and revenues generated from natural gas pipeline operations at Agrinatural, of which HLBE owns a 73.0% controlling interest. Our total consolidated revenues decreased by approximately 2.5% for the fiscal year ended October 31, 2018, as compared to the fiscal year 2017, primarily due to decreases in the average price realized for our ethanol and corn oil which were partially mitigated by increases in average price realized for our distillers’ grains. Total revenues from sales of ethanol decreased by approximately 8.6% for fiscal year 2018 compared to the fiscal year 2017 due primarily to an approximately 11.1% decrease in the average price per gallon we received for our ethanol, mitigated slightly by an approximately 2.8% increase in the volumes sold from period to period. We sold more ethanol gallons during fiscal year 2018 as compared to fiscal year 2017 primarily due to the timing of ethanol shipments and increases in ethanol production at the GFE and HLBE plants. Ethanol production was higher at our plants compared to prior year due to improvements we are making at our plants designed to increase ethanol production and improve efficiencies. We are currently operating our plants above their respective nameplate capacities. Management anticipates relatively stable ethanol production and sales during our 2019 fiscal year. The decrease in the price of ethanol was due to excess supply of ethanol, in addition to lessened demand due to the increase in the approval of small refinery hardship waivers. We occasionally engage in hedging activities with respect to our ethanol sales. We recognize the gains or losses that result from the changes in the value of these derivative instruments in revenues as the changes occur. Separately, ethanol derivative instruments resulted in a gain of approximately $108,000 during the fiscal year ended October 31, 2018, and a loss of approximately $415,000 during the fiscal year ended October 31, 2017. Total revenues from sales of distillers’ grains increased approximately 36.3% for fiscal year 2018 compared to fiscal year 2017. The increase in distillers' grains revenues is primarily attributable to an approximately 35.1% increase in the average price per ton we received for our distillers’ grains from period to period, coupled with an approximately 0.9% increase in the tons of distillers’ grains sold during fiscal year 2018 compared to fiscal year 2017. The increase in the market price of distillers’ grains is due to higher demand, particularly from Vietnam, the European Union, Thailand, and South Korea. The increase in total tons of distillers’ grains sold during fiscal year 2018 compared to the fiscal year 2017 was due to an approximately 1.4% increase in distillers’ grains produced at HLBE’s plant, offset by an approximately 1.0% decrease in distillers’ grain production at the GFE plant. The decrease in tons produced at the GFE plant was due primarily to improved efficiencies of converting corn into ethanol which leads to less production of co-products such as distillers’ grains. GFE also increased the amount of corn oil it was extracting from our distillers’ grains during our 2018 fiscal year which reduced the total tons of distillers’ grains we had available for sale. The increase in tons produced at the HLBE plant was due primarily to an increase in distillers’ grains yield from period to period. Management anticipates relatively stable distillers’ grains production going forward. Separating the corn oil from our distillers’ grains decreases the total tons of distillers’ grains that we sell; however, our corn oil has a higher per ton value than our distillers’ grains. Total revenues from sales of corn oil decreased by approximately 15.1% for fiscal year 2018 compared to the fiscal year 2017. This decrease is attributable to an approximately 13.5% decrease in the average price we received per pound of corn oil sold during fiscal year 2018 compared to fiscal year 2017, coupled with a 1.8% decrease in pounds sold from period to period. Management attributes the decrease in corn oil prices during fiscal year 2018 to a leveling out of the increased demand from the biodiesel industry and the expansion of the RFS advanced biofuel mandate in fiscal year 2017. The RVO for advanced biofuels in EPA’s final rules for 2018 and 2019 was significantly reduced in comparison to the statutory mandate. Additionally, if the biodiesel blenders' tax credit, which expired on December 31, 2018, is not extended, demand may continue to fall. Due to the recent uncertainty in Congress, management cannot predict whether the tax credit will be extended. Although management believes that corn oil prices will remain relatively steady, prices may decrease if there is an oversupply of corn oil production resulting from increased production rates at ethanol plants or if biodiesel producers begin to utilize lower-priced alternatives such as soybean oil or if biodiesel blenders’ tax credit is not renewed and biodiesel production declines. The decrease in corn oil volume sold for fiscal year 2018 compared to 2017 is attributable to reduced oil yield. Management expects our corn oil production will be relatively stable going forward. Our cost of goods sold increased by approximately 3.1% for the fiscal year ended October 31, 2018, as compared to the fiscal year ended October 31, 2017. Cost of goods sold, as a percentage of revenues, also increased to approximately 95.4% for the fiscal year ended October 31, 2018, as compared to approximately 90.2% for the 2017 fiscal year due to a narrower margin between the price of ethanol and the price of corn. Approximately 90% of our total costs of goods sold is attributable to ethanol production. Our cost of goods sold related to corn increased approximately 2.1% for our 2018 fiscal year compared to our 2017 fiscal year, due primarily to a 1.4% increase in the number of bushels of corn processed, coupled with a 0.6% increase in the average price per bushel paid for corn from period to period. The corn-ethanol price spread (the difference between the price per gallon of ethanol and the price per bushel of grain divided by 2.8) for our 2018 fiscal year was approximately $0.16 less than the corn-ethanol price spread we experienced for same period of 2017. The increase in our cost per bushel of corn was primarily related to strong demand, both domestically and internationally. Due to projected decreased corn stocks and strong demand, management anticipates that corn prices will remain steady during our first half of the 2019 fiscal year. For our fiscal years ended October 31, 2018 and 2017, our plants processed approximately 44.4 million and 43.8 million bushels of corn, respectively. Management anticipates consistent corn consumption during our 2019 fiscal year compared to our 2018 fiscal year provided that we can maintain positive operating margins that allow us to continue to operate the ethanol plants at capacity. From time to time we enter into forward purchase contracts for our corn purchases. At October 31, 2018, GFE had forward corn purchase contracts for approximately 3.2 million bushels for various delivery periods through December 2021 and HLBE had forward corn purchase contracts for approximately 2.3 million bushels for various delivery periods through October 2019. Comparatively, at October 31, 2017, GFE had forward corn purchase contracts for approximately 3.0 million bushels for various delivery periods through December 2018, and HLBE had forward corn purchase contracts for approximately 1.8 million bushels for various delivery periods through October 2018. Our corn derivative positions resulted in gains of approximately $2.1 million and $1.1 million for the fiscal years ended October 31, 2018 and 2017, respectively, which decreased cost of goods sold. We recognize the gains or losses that result from the changes in the value of our derivative instruments from corn in cost of goods sold as the changes occur. As corn prices fluctuate, the value of our derivative instruments are impacted, which affects our financial performance. We anticipate continued volatility in our cost of goods sold due to the timing of the changes in value of the derivative instruments relative to the cost and use of the commodity being hedged. For our 2018 fiscal year, we experienced a decrease of approximately 1.5% in our overall natural gas costs compared to our 2017 fiscal year. During the past fiscal year, there has been an increase in cost of natural gas, primarily as a result of an increase in the average price per MMBTU of natural gas due to increased domestic and export demand and lower production. Management also anticipates higher natural gas prices during the winter months due to the typical seasonal natural gas cost increases experienced during the winter months. From time to time we enter into forward purchase contracts for our natural gas purchases. Our natural gas derivative positions resulted in losses of approximately $1,600 and $15,000 for the fiscal years ended October 31, 2018 and 2017, respectively, which increased cost of goods sold. We recognize the gains or losses that result from the changes in the value of our derivative instruments from natural gas in cost of goods sold as the changes occur. Operating expenses include wages, salaries and benefits of administrative employees at the plants, insurance, professional fees and similar costs. Operating expenses as a percentage of revenues rose slightly to 3.0% of revenues for our fiscal year ended October 31, 2018 compared to 2.9% of revenues for our fiscal year ended October 31, 2017. Our efforts to optimize efficiencies and maximize production may result in a decrease in our operating expenses on a per gallon basis. However, because these expenses generally do not vary with the level of production at the plant, we expect our operating expenses to remain relatively steady throughout the 2019 fiscal year. Our operating income decreased by approximately $11.6 million for our fiscal year ended October 31, 2018 compared to fiscal year 2017. This decrease resulted largely from decreased prices for our ethanol relative to the price of corn and the narrowing of margins of our ethanol production segment. We had net other income for our fiscal year ended October 31, 2018 of approximately $75,000 compared to net other income of approximately $190,000 for our fiscal year ended October 31, 2017. We had less other income during fiscal year 2018 compared to fiscal year 2017 due primarily to increased interest expense during the 2018 fiscal year as a result of a full year of interest incurred on GFE’s credit arrangements.